The essay starts with a historical contextualization giving a brief introduction to Xi Xia history and culture before and after the Mongol conquest. Then, at greater length, I discuss the production of Tibetan Buddhist imagery in the Mongol realm. This is followed by a review of the literature examining the major views on the stylistic origins of Yuan Sino-Tibetan art. The following section analyses key Yuan monuments and works of art before touching upon the art of the early Ming dynasty. The concluding section offers general considerations regarding the Xi Xia legacy in China. I Historical Setting: The Xi Xia Empire and its Role in the Mongol Adoption of Tibetan Buddhism. Map 1 The Xi Xia state (982 – 1227), founded by the Tangut people in the 10th century, existed for almost 250 years in a strategic area in Northwest China until it was conquered during the Mongol invasion (see Map 1 for geopolitical situation in East Asia in the 12th and 13th centuries, and major dates of the Jin and Mongol conquests). This prosperous and stable polity was comprised of the territory of modern Gansu province and parts of Qinghai, Ningxia, Shanxi, and Inner Mongolia provinces. The Ordos Tangut tribes declared their resistance to the expansion of Northern Song rule in 982 and formally proclaimed their own dynasty in 1038. In the 11th century the Empire enlarged its territory to the West and established firm control over the entire Hexi Corridor. The Hexi Corridor, the key passage through Gansu allowing traffic between China and the West, was an important part of the Silk Road and the channel through which Buddhist ideas were first brought to China during the Han Dynasty (206 BCE – 220 CE). In the mid-8th century the Tibetan Empire occupied the area. During the period of Tibetan rule in the 8th and early 9th centuries Tibetan Buddhism and culture entered what was a predominantly Chinese Buddhist environment. Many Tibetans settled in Hexi and remained there even after the collapse of the Empire in 840s. Tibetan Buddhism continued to be practiced in some parts of Hexi when the area went under the Tangut rule. 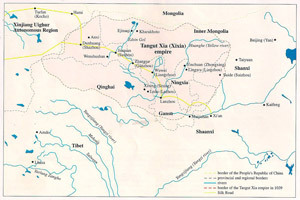 The major groups constituting the multi-ethnic population of Xi Xia were the Tangut, Chinese, Tibetan and Uighur people. The state had three official languages: Tangut, Chinese and Tibetan. The majority of the population was bilingual, speaking both Tangut and Chinese; the Tibetan language was also widely used and learning Tibetan was compulsory for Buddhist monks. The Tangut language belongs to Tibeto-Burman family. A script, devised by the order of the first Xi Xia Emperor in the early 11th century, was partially modelled after Chinese characters. While for the most part the empire relied on its agro-pastoral economy, it also exported salt, horses, and camels, and controlled the trade routes through the Hexi Corridor. The Tangut state was patterned after the Chinese administrative model and actively supported Buddhism. Xi Xia Buddhism combined various Sinitic traditions, including those from the Song China, Liao, and Jin, on the one hand, with traditions from India, Tibet, and Central Asia on the other. A wide range of exoteric and esoteric teachings was organized in a system governed by a religious bureaucracy, a major function of which was the protection of the state and the Tangut ruling family by the performance of apotropaic rituals. The Buddhist community was placed under the supervision of a state administration with an imperial preceptor (Ch. dishi), who also acted as the personal tutor of the emperor, at its head. High-ranking clerics were part of the Buddhist administration and held titles as various preceptors, including the supreme preceptor (Ch. shangshi), the state preceptor (Ch. guoshi), the virtuous preceptor (Ch. teshi). They were engaged in teaching and translating Buddhist texts on behalf of the state. From the mid-12th century onwards, Tibetan lamas from the Kagyu (Tib. bka’ brgyud) school of Tibetan Buddhism were invited to Xi Xia as imperial preceptors, the last of whom reappeared as the state preceptor under the Yuan. Yuan dynasty Buddhism demonstrates key characteristics of the Xi Xia Buddhist model including its apotropaic function, the system of Buddhist administration and the institution of Buddhist preceptors (this will be discussed in detail in a subsequent section). Under the Tanguts Buddhism benefited from large-scale imperial projects including the renovation or construction of numerous monasteries, cave temples, and monumental stūpas. A plethora of Buddhist texts and entire canons were acquired from neighbouring countries. The majority of these texts were translated into Tangut by the end of the 11th century, and hundreds of thousands of printed editions were distributed across the state. By the end of the 12th century, the Tanguts created the so-called ‘Xi Xia’ or ‘Hexi Buddhist Canon’. The canon consisted of 3620 rolls of texts from Sinitic teachings and Tibetan tantric material. It was later printed in Hangzhou during the Yuan dynasty. Following the Xi Xia practice Tibetan texts were added to the Yuan editions of the Chinese Qisha and Puning canons, which were also printed in Hangzhou (this will be discussed in a section on printed sutra frontispieces from Hangzhou). The Xi Xia sangha was a multi-ethnic Buddhist community with monks of Tangut, Uighur, Tibetan, Chinese and other origins. The proximity of these groups within the syncretic and multifaceted realm of Xi Xia Buddhism came to be expressed in a great variety of Buddhist imagery and mixture of styles in Xi Xia art. As an example, painted images retrieved from Khara Khoto attest to a cultural melting pot where artists worked in many different styles. Some artworks are based on a single style, for example the style of the Northern Song dynasty for works associated with Chinese Buddhism or the Indian Pāla style for works associated with Tibetan Buddhism. Others demonstrate an innovative mixture of styles and themes based on both Chinese and Tibetan traditions. The coexistence of themes and styles associated with both Chinese and Tibetan Buddhism is a characteristic trend of Xi Xia culture that continued under the Mongols and manifested in the art of the Yuan dynasty. As stated above, works related to Tibetan Buddhism are mostly based on the Indian Pāla style. However, they possess distinctive Xi Xia features and can be easily distinguished from those in the Indian Pāla style made in Tibet. This confirms the idea expressed by Evgeny Kychanov and supported by Xie Jisheng that Xi Xia was receiving artistic input directly from India, not only from Tibet, as had been commonly thought. In fact, lavish imperial patronage attracted many foreign missionaries. Masters from Northern India held positions in the Buddhist administration, while Tangut translators, monks, and pilgrims visited the Buddhist sites of India. While almost no Buddhist artwork has survived from the Xi Xia capital and major cities, visual evidence from the cave temples in Hexi (e.g. Mogao, Yulin, Dong Qianfodong) and artefacts (e.g. sculptures, painted scrolls) recovered at Khara Khoto and other sites provide compelling examples of the outstanding artistic achievements of the Xi Xia people. Map 2Following several military conflicts in the early years of the 13th century, Xi Xia finally fell to the Mongols in 1227. The capital and most of the large cities were destroyed. The hitherto Xi Xia territory became a Tangut province within the Mongol Empire and was entrusted to Goden Khan (1206 – 1251) – the second son of Chinggis Khan’s successor Ogedei – who settled in Liangzhou (i.e. present day Wuwei) (Map 2). Liangzhou had been one of the major Xi Xia cities and had a large Tibetan community. After the conquest it became an important centre of Mongolo-Tibetan interactions. In 1240, Goden’s troops led by a Tangut named Doorda Darqan invaded Central Tibet where they ransacked several monasteries and massacred hundreds of monks. To secure his control in Tibet Goden summoned the head of the Sakya (Tib. sa skya) school of Tibetan Buddhism Sakya Pandita (1182 – 1251) to Liangzhou. The Sakya hierarch arrived there with his two infant nephews in 1246. They remained at Goden’s court as hostages, as was a common Mongol practice towards leaders of conquered states. Sakya Pandita ensured regular tribute from Tibet consisting of gold dust and other goods desired by the Mongols. In addition, he engaged in religious activities including teaching in Liangzhou till his death in 1251. The Tibetan literary tradition credits Sakya Pandita with Goden’s conversion to Buddhism as a result of which Tibet was spared from destruction. Goden became an active patron of Tibetan Buddhism and was eventually recognized as the reincarnation of the Tangut Emperor in several Tibetan sources. Already in the early years of the second half of the 20th century Yury Roerich and Evgeny Kychanov had established that the Mongols learned many aspects of Tibetan Buddhism through the Tanguts. Evgeny Kychanov suggested that Xi Xia Buddhist culture deeply influenced the Mongols and played a crucial role in their adoption of Buddhism. Yury Roerich argued that the Mongol’s patronage of Tibetan Buddhism followed the Xi Xia example and started in former Xi Xia lands before the arrival of Sakya Pandita. The Tanguts probably influenced Goden’s choice of Sakya Pandita as a representative for Tibet. More recent scholarship has not only confirmed these ideas, but also revealed a dominant Xi Xia quality present in Yuan Dynasty Tibetan Buddhism. Sakya Pandita’s nephew, known as Pagpa (1235 – 1280), was 10 years old when he arrived at the court of Goden in Liangzhou. There, he learned the Mongolian language and traditions and grew up within the Buddhist culture of former Xi Xia. After Goden’s death in 1251, his cousin Qubilai Khan (1215 – 1294) received the territories of North China. In the process, he took over Goden’s religious entourage, including Pagpa who later became Qubilai’s court chaplain and his personal religious teacher. In 1260 Qubilai was chosen as the Great Khan. In the same year, he made Pagpa a state preceptor and delegated to him the administration of Tibet and control over the Buddhist communities of the different traditions throughout the Mongol Empire. In 1270 Qubilai bestowed on Pagpa the highest title of imperial preceptor and ceremonially handed over to him the seal of the Xi Xia emperor. In Ruth Dunnell’s words this confirmed the greatest Buddhist authority of Tangut emperors and “ritually signalled the act of transference of the emperor-priest relationship” from the Tangut court to the Mongols. In 1271 Qubilai proclaimed the new Yuan dynasty in China where Sakya hierarchs would serve as imperial preceptors till its fall in 1368. Although the Sakya school played a special role in Mongolo-Tibetan interactions, other school of Tibetan Buddhism were also well represented in Yuan China. Particularly influential were the Karma Kagyu, who eventually overturned the Sakya dominance towards the end of the dynasty. The 3rd (1284 – 1339) and 4th Karmapas (1340 – 1383) were invited to the Yuan capital Dadu and spent considerable time in China. The 4th Karmapa established a close relationship with the last Yuan Emperor Toyon Temur (1336 – 1405), which was comparable to that of Pagpa and Qubilai Khan. The popularity of the Karma Kagyu in China in the late Yuan continued during the rule of the early Ming Emperors. Tibetan hierarchs conducted numerous protective rituals for the prosperity of the Yuan state and the Imperial family. At the same time, many of them had personal relationships with members of the Mongol nobility and provided them with Buddhist teachings and tantric initiations. These activities were generously rewarded in the form of financial and material donations, providing a massive flow of resources from China into Tibet. Anning Jing asserted that the renaissance of art in Tibet in the late 13th and 14th centuries was largely enabled by Yuan China’s patronage of Tibetan Buddhism. In spite of the fact that, the Mongols regarded Tibetan Buddhism as superior to Chinese Buddhism, they supported Chinese Buddhist schools and other local cults as well. The simultaneous espousal of Tibetan and Chinese traditions is a feature typical of both the Xi Xia and Yuan rules. According to The Official History of the Yuan Dynasty (Ch. Yuan Shi), the Yuan Emperors were responsible for the commissioning of many Daoist, Confucian, and Buddhist temples. Imperial Buddhist temples were built in the Chinese style and named in accordance with Chinese nomenclature. Some of them also functioned as Mongolian ancestor shrines. Images inside these edifices were drawn from the repertoires of both Tibetan and Chinese Buddhism echoing a characteristic of Xi Xia Buddhist culture. These temples housed monks following both traditions . According to Chinese sources monks following the Tibetan tradition were present in Yuan China in great numbers. However, their exact place of origin is not clear as they are often referred to only as ‘Western monks’ (Ch. xi-seng), a broad term that could designate monastics of Tibetan, Uighur, Xi Xia or other origins. At the same time, a brief comparison between the population of Xi Xia and Tibet suggests that a greater proportion of the monks may well have been from Hexi. As stated by Kychanov the population of Xi Xia was already 2,5 million during the 11th century and it could well have reached 5 million by the 13th century. In contrast, the population of Ngari, U-Tsang and Amdo regions of Tibet was only 1,08 million in the 13th century. In terms of geography, the key populations centres in Hexi were roughly three times closer to the Yuan capital of Dadu (modern Beijing) than those in Tibet, and, in contrast with Tibet, the former Xi Xia territory was fully incorporated into the Empire. Buddhism in China under the Yuan demonstrates many features originated in Xi Xia. Following the Xi Xia example, the Mongols supported both Tibetan and Chinese schools and appointed Tibetan lamas as imperial preceptors. The position of Mahākāla as a state protective deity and the importance of the Uṣṇīṣavijayā cult in the Yuan were a direct continuation of Buddhist praxis under the Xi Xia Empire. The popularity of the Hevajra and Cakrasaṃvara tantras, and the yogic practices of the six doctrines of Naropa also probably stemmed from Xi Xia Buddhism. After the conquest many Tanguts went into the service of the Mongols. Because of their knowledge of both the Chinese and Tibetan cultures and languages, Tanguts were naturally the most suitable people to assist the Mongols in governing the empire. According to Evgeny Kychanov, many Tangut officials were employed all around China. They belonged to the privileged caste of semu people (Central Asians or those from further West) specially trusted by Mongol rulers during the Yuan dynasty. The Yuan shi describes the great number of high ranked Tangut commanders in the Mongol armies. Tangut Confucian scholars held high positions in the Yuan administration; the Mongol adoption of the traditional Chinese education system during the late Qubilai reign is credited to the activities of the Tangut Confucian scholar Gao Zhiyao. An influential group of Tanguts, including the state preceptors Yang Lianzhenjia and Guan Zhuba, operated in the Yuan Buddhist administration; monks from Hexi were engaged in translating Tibetan Buddhist texts into Chinese. In addition, many Tanguts became prominent figures in Chinese culture. Herbert Franke drew attention to the fact that “Tanguts produced more poets in Chinese than any of the other national minority” during the Yuan. All this is in a sharp contrast to the role played by Tibetans in China. For the most part, they did not speak Chinese and their activities were mostly confined to performing rituals. As was shown before, the Mongol’s patronage of Tibetan Buddhism started in the former Xi Xia territories in northwest China a few decades before the formal establishment of the Yuan Dynasty in 1271. Despite the destruction of the Xi Xia state during the conquest, the majority of the population survived. William of Rubruck and Marco Polo visited the Tangut areas in 1253 – 1255 and 1271 – 1274 respectively and described them as densely populated and economically prosperous. Marco Polo witnessed thriving Buddhist communities and many monasteries and temples full of exquisite sculptures of various kinds. His testimony would seem to indicate that local artists continued to work for the Mongols in Hexi. At the same time, Evgeny Kychanov writes that many Xi Xia craftsmen were also taken to Mongolia and worked in the Mongolian capital Karakorum in the second quarter of the 13th century. Already by the middle of the 13th century Karakorum had become an active Buddhist centre. William of Rubruck, for instance, sojourned in the capital in 1253 – 55 and reported on the existence of twelve “idol temples”. Excavations conducted at the Great Stūpa Temple in Karakorum, which was constructed between 1235 and 1256, have yielded numerous moulded clay votives (Tib. tsha tsha), most in the form of stūpas, and fragments of clay sculptures and frescoes in the Tibetan tradition. They display strong stylistic connections with objects from the former Xi Xia city of Khara Khoto and attest to the great influence of Tangut Buddhism in Mongolia. Evidence for the extensive production of various metal objects, including sculptures, was also found at the Karakorum site. Thus it is apparent that the production of Tibetan Buddhist imagery was already developed in Northwest China and Mongolia by the time when Qubilai Khan decided to move the capital from Karakorum to Kaiping in 1256. Thousands of artists from the four corners of the empire and presumably from the old capital were summoned to the new capital where they were assigned to various service agencies within the imperial workshops. On this occasion Pagpa brought his Nepalese protégé Anige (1245-1306), who arrived in Kaiping with a team of twenty-four or so Nepalese and Tibetan artists in 1262. The details of Anige’s career have been thoroughly discussed by Anning Jing. In summary, the Nepalese master directing tens of thousands craftsmen under him, supervised the enormous production of luxury goods for the Yuan imperial households and constructed several Buddhist temples and monumental stūpas in the last quarter of the 13th and early 14th century. Said to be a genius sculptor, Anige is credited with the creation of many sculptures for Buddhist, Daoist and Confucian temples. Sadly, no artworks securely attributed to his hand have survived. In 1264 Qubilai proclaimed the establishment of the new “great capital” Dadu, the construction of which was finished by 1276. The imperial workshops were transferred there from Kaiping. The Record of the Painting and Sculptures of the Yuan Dynasty (Ch. Yuandai huasu ji), an incomplete work-record from the imperial workshops for the period 1295 – 1330, indicates the presence of artists with Chinese and foreign names. The origin of these artists, however, is rarely certain. The Chinese names might denote Han Chinese from anywhere in China or other states conquered by the Mongols. But they could also belong to someone from any of the numerous sinicized peoples including Uighurs, Khitans, and Jurchens. Foreign names are given in Chinese transcription and reliable reconstruction of their original forms can be highly problematic. Tibetan names, even if identified as such, might have stood for people from Tibet or for ethnic Tibetans from Hexi or elsewhere. At the same time, they could have belonged to Tanguts, whose names are often difficult to distinguish from Tibetan names. To complete the picture, Buddhist names might have been taken by any follower of this religion. In some rare cases, the text definitely mentions artists from Nepal. These in all likelihood must have belonged to the group of twenty-four artists who travelled from Tibet to China with Anige. Stephen Haw has suggested that the majority of artists responsible for the production of Buddhist images in the Tibetan tradition in the imperial workshops originated from former Xi Xia territories and not from Tibet. This seems to be the most probable scenario as the production of Buddhist art flourished in the Tangut territory. Artists from there were also engaged in art production in the old capital of Karakorum and were likely transferred to the new capital of Kaiping and then to Dadu. It is important to mention that artists from captured domains were the private property of the Mongol ruling elite and could be easily transferred anywhere within the empire. In contrast, Tibet was never fully integrated into the Yuan Empire, as it was not conquered and occupied by the Mongols in the same sense that China and Xi Xia were. Therefore, it seems unlikely that many Tibetan artists were readily available for the Mongol’s projects. Furthermore, there is strong reason to believe that Tibet had a shortage of skilled artisans at that time. This is evidenced by the fact that the Sakyapas could not find enough artisans in Tibet for the construction of the golden stūpa for Sakya Pandita in 1260 and had to reach out to the king of Nepal, who eventually supplied eighty Newars and Indians. The same was also true at Shalu monastery when the local ruler Drakpa Gyaltsen started his renovation project in 1306. This time the necessary artisans were supplied by the Yuan Imperial workshops. Given this, Anige and his twenty-four colleagues may well have been all that the Sakyapas could contribute to the imperial workshops of the new Yuan capital. Although the historical literature clearly confirms the production of Tibetan Buddhist imagery, there is insufficient information to allow us to stylistically define this imagery with any confidence. For example, the unit responsible for production of Buddhist images in the Tibetan tradition was called fanxiang tiju si. This loose term fanxiang was used to describe images rendered in the foreign style associated with India and other lands to the West. Yuan Dynasty art has been the subject of various publications including the catalogues for two major exhibitions at the Cleveland Museum of Art (1968) and the Metropolitan Museum of Art (2010). The following review of the literature summarises the recent and contemporary views regarding the stylistic origins of Yuan Sino-Tibetan art. In his article for the Cleveland exhibition (1968) The Art of the Yuan Dynasty, Sherman Lee emphasised the contribution of Tibetan Buddhism to Chinese art and highlighted Nepalese stylistic elements as a feature of Yuan Buddhist imagery. Given the scarcity of Yuan examples, his aesthetic considerations were illustrated with an early Ming dynasty figure of Tara from the Yongle reign (1402 – 1424). No stylistic analysis was conducted to confirm the image’s Nepalese characteristics. The same image was discussed in the catalogue entry by his co-author Wai-kam Ho where the deity’s broad face and five-leaved crown were used as evidence of Tibetan influence. This influence was explained by the fact that Nepalese and Tibetan officials and artists were employed at the Yuan court. Later, Sherman Lee described a porcelain image of a Bodhisattva dated to the late 14th century as having a ‘Nepalese-Tibetan appearance’. Referring to the same image, Wai-kam Ho simply states that there is an obvious Nepalese influence on the image. Finally, Ho’s description of a frontispiece illustration from the Qisha Canon repeats ‘the far reaching influence of the Nepalese style’ and ‘strong Nepalo-Tibetan influences’. While the work of these authors remains seminal for the study of Yuan Dynasty art, their analysis shows uncertainty surrounding the stylistic origins of their examples and did not offer any comparative material. In her Early Sino-Tibetan Art (1975) Heather Karmay recognizes that the “lamaist or Nepalese influence on the arts of China from the Yuan onwards, is traditionally attributed to the presence of the young Nepalese artist Anige”. However, she expresses reservations and argues that “given the limited number of lamaist objects known to date from the Yuan it is difficult to ascertain whether two related traditions, one Nepalese and the other Tibetan, entered China at this time, or whether the two should be assimilated, counting Anige as the original exponent”. She also remarks that the art of Xi Xia constituted “early evidence of the spread of a Tibetan style before the Yuan dynasty”. Anige’s activity at the Yuan court was also the subject of an article by Anning Jing entitled The Portraits of Khubilai Khan and Chabi by Anige (1245-1306): A Nepali Artist at the Yuan Court (1994). The author essentially based his research on Chinese literary sources, namely: Anige’s official epitaph, his biography as found in The Yuan Shi, and The Record of the Painting and Sculptures of the Yuan Dynasty (Ch. Yuandai Huasu Ji). In these works, Anige is described as an accomplished and versatile artist and an efficient supervisor of large-scale projects. Already proficient in making Tibetan imagery, he “mastered traditional Chinese artistic idioms” and created paintings and sculptures for Confucian and Daoist temples. In addition to this work from the written sources, Anning Jing conducts a stylistic analysis of several examples from the Tibetan tradition. Only two of them, however, can be securely attributed to the Yuan dynasty: the so-called ‘White Stūpa’ in Beijing built by Anige in 1279 (Fig.1), and the figure of Mañjuśrī from the Palace Museum dated by inscription to 1305 (Fig. 23). The architectural style of the White Stūpa was understood as a combination of three different artistic traditions: Indian Pāla, Nepalese, and Chinese. However, comparative examples are given only for the Indian Pāla stylistic elements. Regarding the statue of Mañjuśrī, the author stresses its “standard Nepali features” excluding Indian Pāla elements and “any possibilities of Chinese design”. Here again, the author fails to support his claims with comparative examples. Finally, despite the private nature of the inscription, Anning Jing attributes the production of this work to the imperial workshops supervised by Anige. The ‘White Stūpa’ and the statue of Mañjuśrī will be discussed at greater length in section IV, where I will highlight their relations to the Xi Xia artistic tradition. Rob Linrothe was the first to stress that the patronage of Buddhist art in Xi Xia likely served as a precedent for Yuan Buddhist art in his Peripheral Vision: On Recent Finds of Tangut Buddhist Art (1994). In doing so, he suggested the Tangut origin for “a well developed pictorial and thematic vocabulary that was then widely employed by the Mongols”. In the Metropolitan Museum of Art exhibition catalogue The World of Khubilai Khan: Chinese Art in the Yuan Dynasty (2010), Denise Patry Leidy’s essay Indo-Himalayan style under the Mongols states that imagery from Nepal and Central Tibet was introduced to China during the Yuan dynasty. In her reading, this became the foundation for the production of “works with Indo-Himalayan imagery” and works that reflected a stylistic melding of traditional Chinese and Indo-Himalayan imagery. In her essay she recalls that the Nepalese artist Anige is credited with the introduction of “Nepali-based artistic traditions” while supervising artisans in the Yuan Imperial workshops towards the end of the 13th century. This tradition was associated with the Nepalese style favoured by the Sakya school. The author readily admits, however, that few works displaying Nepalese features survive. 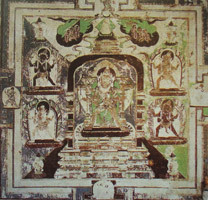 As an illustration, she discusses the image of Mañjuśrī preserved in the Palace Museum (Fig. 23). The author suggests that the square face, use of inlay as well as the style of the crown, decorations, and lotuses originated from the Nepalese and Tibetan traditions. However, no stylistic comparisons with Nepalese or Tibetan material were suggested. The remainder of the Sino-Tibetan objects and monuments discussed were ascribed to the style of the Indian Pāla dynasty and the art of the Xi Xia Empire. That same year the numerous attempts to attribute particular artworks to Anige (Aniko), or Anige’s style were summarised and then critically examined by David Weldon in his article On Recent Attributions to Aniko (2010). The author points out that “the aesthetic of Aniko’s style has in fact never been established” and concludes that “at this stage there is insufficient information, whether technical or art historical, to make any foolproof attribution”. In recent years several metal sculptures have been attributed to the Yuan mostly on the basis of similarity with the aforementioned Yuan figure of Mañjuśrī from the Palace Museum, Beijing. (Fig. 23) Stylistic analysis of these works were published by Phillip Adams in his article Imperial Yuan Gilt-Metal Buddhist Sculptures: Stepping Stones to the Early Ming (2014) and by Robert Bigler in two catalogues: Art and Faith at the Crossroads Tibeto-Chinese Buddhist Images and Implements from the 12th to the 15th Century’ (2013) and Before Yongle: Chinese and Tibeto-Chinese Buddhist Metal Images from the 13th and 14th Century (2015). Both authors repeat the idea that the style of the Yuan sculptures under review was developed in the imperial workshops under the supervision of Anige. 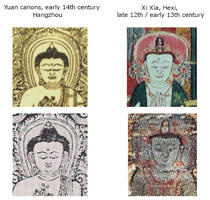 Phillip Adams proposed that the Yuan images produced at the imperial workshops “were often copies of, or heavily influenced by, Nepalese or Tibetan sculptures”. Robert Bigler divides the Yuan sculptures into two groups, ‘Nepalo-Chinese’ and ‘Tibeto-Chinese’, according to their style. 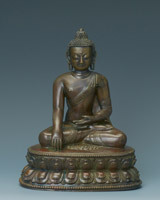 He insists, however, on the predominance of Nepalese style in the sculptures attributed by him to the Imperial workshops. Consequently their style was labelled ‘Nepalo-Chinese’. I will discuss some of these works in section IV. Jane Casey’s essay Buddhist Initiation Paintings from the Yuan Court (1271-1368) in the Sino-Himalayan Style (2014) investigates a set of Medicine Buddha with entourage miniature paintings from a private collection attributed by the author to the Yuan dynasty, and possibly to the reign of Qubilai Khan (r. 1271 – 1294) and the Anige atelier. The author’s argument postulates a Nepalese style-based artistic tradition in China, but admits that few examples of this tradition exist. Nepalese characteristics in Yuan art were demonstrated only in one example, the frontispiece for the Qisha canon (Fig.20), where, according to her, the figures have Nepalese facial features. (I will later investigate this statement in a section on the Hangzhou frontispieces and show that the figures in the Qisha frontispieces rather have facial features found in the art of Hexi). The mixture of Nepalese and Chinese stylistic elements seen by Casey in the paintings was considered as evidence of a Yuan dynasty provenance. Additional iconographic evidence for the Yuan provenance was found by the author in two paintings from the set (Casey fig. 53 and 54). 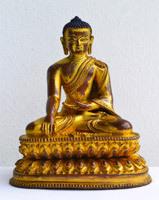 A figure wearing a typical attire of Indian pandits, whose depictions often appear in the Medicine Buddha entourage, (Casey fig. 53) was groundlessly identified by the author as a Sakya monk and later in her lecture in Brussels on 10 June 2016 as Pagpa himself [89a]. Another painting (Casey fig. 54) depicts a figure wearing a distinctive turban with a Buddha head on top, an attribute normally associated with the Tibetan king Songtsen Gampo, who is also often depicted in the Medicine Buddha entourage. However, Casey suggests that the painting depicts Qubilai Khan reasoning that the figure is clad in luxurious garb in the Mongol fashion and holds the attributes of Mañjuśrī  In my opinion, the discussed figures should be straightforwardly understood as an Indian Pandit and the Tibetan king Songtsen Gampo as typical members of the Medicine Buddha entourage. In respect of style, the combination of Nepalese and Chinese stylistic features in the discussed paintings points to a place of provenance in Central Tibet, where both Nepalese and Chinese aesthetics became prominent in art towards the early 15th century. The paintings are stylistically close to the early 15th century Gyantse Kumbum murals and to a set of 14th to 15th century Tibetan paintings depicting Arhats and bearing Tibetan inscriptions from the Jokhang Temple, Lhasa . Thus I argue that the paintings originate from Tibet and should be dated ca. 1400. The most recent publication on the subject is a book by Shane McCausland entitled The Mongol Century: Visual Cultures of Yuan China, 1271 – 1368 (2016). While the author does not discuss the stylistic origins of Sino-Tibetan art during the Yuan, he nonetheless observes a change in the Indo-Himalayan features of Tibetan Buddhist imagery produced in Yuan China. Describing the figure of Mañjuśrī from the Palace Museum he suggested its authorship by Anige. Tibetan Buddhist imagery was not produced under Mongol patronage before the arrival of Anige and his team to China. The Nepalese artists at the imperial workshops necessarily worked in the Nepalese style and this became the foundation for the Nepalese style-based tradition in China. Tibetan teachings and Tibetan Buddhist imagery were spread in Yuan China mainly by the Tibetan Sakya school, the art of which was dominated by the Nepalese style. As was shown in the previous section, the Mongols were deeply influenced by the Buddhist culture of the Xi Xia Empire. A well-developed system of manufacture of Tibetan Buddhist imagery had already existed in Northwest China and Mongolia for a few decades by the time Anige joined the imperial workshops. Newars were traditionally regarded as superior craftsmen because of their ability to create images with outstanding artistic and technological qualities. At the same time, they were and are known for their ability to adapt their style according to where they worked and the tastes of their patrons. It is important to remember that we only know of a handful of Newars among the thousands of artists in the imperial workshops. They worked in an environment that was culturally very distant from that of Nepal, and the adoption of local aesthetics seems to be the most probable outcome. This can be confirmed by the example of Anige himself, who embraced the local culture and lived life of a “sinicized gentry.” He mastered Chinese calligraphy and collected Chinese paintings. For these reasons, Newar activity in the Yuan Imperial workshops should be understood in terms of technological innovations rather than in the promotion of the Nepalese style in China. In addition, Anige himself certainly should be credited with creation of facilities for the large-scale production of top quality religious paraphernalia and luxury objects for the Imperial households. Despite the privileged position of the Sakya school, monks from Tibet and Hexi who belonged to other schools of Tibetan Buddhism were also active in Yuan China. Especially welcomed by the Mongols was the Karma Kagyu school, which by the end of the Yuan had superseded the influence of the Sakya in China. In addition, according to recent research by David Jackson, the Sakyas in Tibet contemporaneous with the Yuan dynasty commissioned works in both the Indian Pāla and Nepalese styles. The Nepalese style only became dominant in Tibetan art sometime between 1360 – 1450, by which time the Yuan dynasty had already collapsed. The influence of the Nepalese style on the art of Hexi can hardly be observed at all. It is necessary to emphasize that some authors of the works reviewed above, have pointed to alternate sources of artistic influence in describing Yuan Buddhist art. Heather Karmay briefly recalls that a Tibetan artistic trend, along with other styles, was already deeply integrated in Xi Xia before the Yuan. Rob Linrothe, for his part, confidently suggests the Xi Xia background of Yuan art. The section investigates securely datable Yuan material in different genres such as architecture, sculptures, drawings, textile, and stone carvings. I will highlight features common to all examples and thus representative of the Yuan style. The inclusion of only securely datable material allows many misleading attributions to be removed from the discussion. The list of the examples is limited because of the short lifespan of the dynasty and the destruction of Mongol-related monuments and objects in the post Yuan years. The White Stūpa, Beijing, 1279 and a stūpa at Wutai, 1301. Feilaifeng sculptures, Hangzhou, the two last decades of the 13th century. Printed sutra frontispieces from Hangzhou, the first decade of the 14th century. A statue of Mañjuśrī, Palace Museum, Beijing, 1305. Kesi Vajrabhairava maṇḍala, Metropolitan Museum of Art, c.1330 – 1332. A sculpture of Mahākāla, datable to 1292, from the Guimet Museum was not included in my analysis. Although the provenance of the figure is unknown, it has ​often been published in association with the artistic tradition of the Yuan court on the basis of a dedicatory inscription in Tibetan language inscribed on the back of this image. (see Casey 2014, fig. 2)  The inscription ​gives the name of four people:​ Qubilai Khan, Pagpa, ​the​ artist Könchok Kyab​ (Tib. dKon-mchog​ skyabs​), and ​the donor Atsar Bakshi (Tib. A-tsar ​b​ ag-shi​).​ T​he donor ​was​ identified as one of Pagpa​'s disciples​ and​ an ​ important official and landowner in Central Tibet at the time when the sculpture was produced. The inscription ​d​oes not​ mention​ a​ny​ place of production​ and its content ​​does not suggest that the sculpture was ​meant to be ​offered to Qubilai Khan, or to Pagpa - who ​had died 12 years earlier​ - ​ or ​to ​ the Yuan court. Therefore, the association of the sculpture with the Yuan court art seems to be highly speculative. In fact, t​he figure ​is​ unlikely to have been ​​ ​produced​ in China as the inscription is​ clearly​ dated according to the Tibetan calendar and not according to the Chinese calendar or using the Chinese traditional system with the year of a given reign as would be expected if it included a date and was made in China and particularly in an imperial workshop.. The Mongols adopted the Chinese system in 1271, when Qubilai formally proclaimed a Chinese style dynasty and declared that 1272 was the first year of the Great Yuan. I would therefore argue that ​the sculpture was made in Tibet​, more precisely in Central Tibet where the donor was based​. T​he ​laudatory mention of Qubilai Khan and Pagpa likely reflects the donors’ s loyalty to ​the Mongolian ruler and his Buddhist preceptor. It seems consistent with his official ​position​ as an administrator of the Sakya/Mongol rule in Tibet. Different styles have been ascribed to the sculpture, Tibetan style (Stoddard, 1992), “the most pure Newar esthetic style” (Heller, 1999), the Sakya version of Nepalese variants of Indian Pāla style (Leidy, 2010), Nepalese style (Casey, 2014). In my opinion, this exquisite Mahākāla image ​displays distinctive Indian Pāla style features​ and belongs to a group of fine sculptures made of similar beige stone​ in Indian Pāla tradition​. Although only a few beige stone sculptures were excavated in North-East India, many others were documented in Central Tibet, particularly in the Potala palace collection. Most of them were attributed by von Schroeder to the 11th or 12th centuries as works by Indian artists in Tibet or in India for Tibetans. According to him Tibetan artists were not able to produce such high quality works. J.C.Huntington, however, argues for existence of a highly developed Tibetan school of stone carving in Indian Pāla tradition, premier medium of which was a beige stone. [99a] The discussed Mahākāla sculpture was made by an artist, who judging by his name, was Tibetan. This supports the Huntington views and shows a continuation of Indian Pāla tradition of stone carving in Central Tibet up to the 13th and 14th centuries. This also suggests a 13th/14th century date for some of the pieces from the group which display stronger stylistic similarities with the Guimet Mahākāla (for example, see von Schroeder fig. 120 B-C, 121 D, 121E). Altogether, the Mahākāla image under review demonstrates the popularity of India Pāla artistic tradition in the 13th /14th century Central Tibet and confirms a stylistic diversity in the art associated with the Sakya patronage at the time of the Yuan dynasty. 1) Anige Stūpas, 1279 and 1301. Two imperially commissioned stūpas are believed to be projects designed and supervised by Anige himself. The so-called White Stūpa in Beijing (the former Yuan capital of Dadu) was completed in 1279. (Fig.1, Fig.2) The stūpa in the Wutai Mountains was built in 1301 (Fig.3). Their shapes in general follow an Indian Pāla model known as a ‘Kadampa stūpa’ in the Tibetan world. Despite the fact that metal replicas, traditionally attributed to the 13th -14th centuries, are common in Tibetan art, architectural representations of Kadampa stūpa are not found in Tibet. Neither are they found in Nepal. 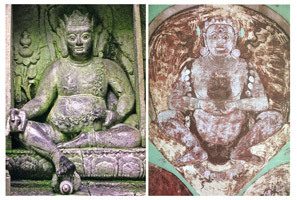 Nepalese monumental caityas have considerably different shapes mostly following the Svayambhunath Mahacaitya prototype. A few Kadampa stūpa-like edifices, however, are known in Hexi from the Xi Xia Empire period. The bottle-shaped stūpa in Wutai, for example, can be compared to the Xi Xia stūpa at Weizhou (Fig. 4). Likewise, the shape of the White Stūpa in Beijing is close to that of the Xi Xia Hundred and Eight Stūpas in Xiakoushan (Fig. 5), and to the upper portion of the Hongfo Pagoda (Fig. 6). In terms of architectural style, both imperial stūpas integrate Indian and Chinese aesthetics. At Wutai, for instance, the monumental stūpa rests on an octagonal platform with Chinese tiled eaves, which resembles the lower part of a Chinese pagoda (Fig. 3). The whole structure can be understood as a Chinese pagoda topped with an Indian stūpa. This would seem to confirm a narrative whereby a much older pagoda, which existed on the site, was incorporated into the stūpa during its construction. A similar combination of pagoda and stūpa designs is found in Hexi architecture from the Xi Xia period. 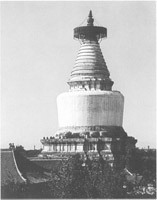 For example, the Hongfo Pagoda displays an Indian Pāla stūpa erected on top of a Chinese octagonal foundation (Fig.6). Rob Linrothe suggests that this edifice illustrates a key feature of Xi Xia Buddhism where Chinese Mahayana Buddhism and Tibetan esoteric teachings were incorporated in one unitary structure. If this is the case, the lower part of the building would embody Chinese Mahayana teachings as earlier stages of Buddhist practice, while the Kadampa stūpa-like upper part would symbolize more advanced Tibetan esoteric Buddhism. This symbolism is also relevant for Yuan Buddhism, where Chinese and Tibetan traditions were both patronised by the Mongols, but Tibetan Buddhism was considered superior to its Chinese counterpart. A similar concept is observable in the White Stūpa in Beijing (fig.1) that was constructed on the site of a ruined Liao dynasty pagoda. The colossal stūpa in the Indian style was put on a platform with four Chinese shrines at its corners. The whole structure was located at the centre of the Great Temple of Sacred Longevity and Myriad Peace (Ch. Da Shengshou Wan’ansi), an imperial temple in Chinese style, which once housed one of the greatest treasures of Chinese Buddhism - the Sandalwood Buddha sculpture (Fig. 2). To summarise, the Yuan monumental stūpas discussed follow a mode established earlier in Xi Xia architecture, based on the integration of the Pāla Indian and Chinese artistic traditions. Although the stūpas were constructed by Anige, they differ considerably from the Nepalese model, contrary to what would have been expected if Anige and/or the Sakya promoted the Nepalese style in China. More than a hundred rock sculptures at Feilaifeng in Hangzhou are related to the religious activities of Yang Lianzhenjia, a Tangut monk who between 1277 and 1292 occupied the highest Buddhist rank in Southern China, the most populated part of the Mongol Empire. Several sculptures bear dedicatory inscriptions dated from 1283 to 1292 identifying Yang Lianzhenjia, his consort, and other local officials as the commissioners. A striking feature of Feilaifeng is the positioning of sculptures from the Chinese and Tibetan Buddhist traditions side by side in complete harmony. Both traditions are executed in essentially the same style, or in Rob Linrothe’s words, in “alternate modes within the same style”. I will be using terms such as ‘Chinese mode’ and ‘Tibetan mode’ to describe imagery normally associated with the Chinese and Tibetan Buddhist traditions respectively. Fig. 7Yang Lianzhenjia is known to have been a supporter of both the Tibetan and Chinese schools of Buddhism. The Feilaifeng sculptures well reflect his religious views attesting to his Hexi origin. A group of sculptures commissioned by Yang Lianzhenjia in 1292, for instance, features Buddha Amitābha in the Chinese mode flanked by Mañjuśrī and Prajñāpāramitā in the Tibetan mode (Fig.7). Rob Linrothe ascribed the “mixed Tibetan and Chinese vocabulary” at Feilaifeng to the Xi Xia roots of Yang Lianzhenjia and also to his intention to expand traditional Chinese Buddhism with an infusion of Tibetan teachings. Lai Tianbing in his monumental study of Feilaifeng argues for the sculpture’s Pāla Indian stylistic roots and highlights the persistence of the Xi Xia artistic tradition. Evgeny Kychanov ascertained that many people from Xi Xia migrated to South China after the conquest. This probably explains the presence of a few Tangut monks including Yang Lianzhenjia in the South China Buddhist administration. These people were instrumental in the promotion of Tibetan Buddhism and Xi Xia Buddhist culture in South China in the early Yuan. Their activities resulted in the creation of Tibetan Buddhist sculptures at Feilaifeng, commissioned within several years after the Mongol conquest of the city in 1276. The origin of the artists employed at Feilaifeng is unknown, but it is clear that they were proficient in both Chinese and Tibetan traditions. Future research may be able to determine whether local artists were given models to follow or if artists from Hexi were employed. A striking example of Xi Xia traits at Feilaifeng is the group image Uṣṇīṣavijayā with retinue (Fig.8). This is the largest composition at the site. Its size and quality highlight the importance of the Uṣṇīṣavijayā cult in Yuan China that in turn mirrors its importance in Xi Xia. The goddess is depicted in the Tibetan mode. She is seated inside the stūpa on a high multi-tiered throne and is flanked by two Bodhisattvas in the Chinese mode. Two pairs of wrathful guardians depicted in the Tibetan mode occupy arched niches on the both sides of the stūpa. Two divinities, probably Apsaras, float on Chinese style clouds above the stūpa and make offerings to the goddess. The outline of the stūpa is decorated with a scrollwork also seen in Indian Pāla examples (Fig.9). The whole composition represents an Uṣṇīṣavijayā maṇḍala. While the layout is unusual in Tibetan art, a similar representation is found in Xi Xia art, e.g. in a Marici maṇḍala in cave 3 at Yulin (Fig. 10). 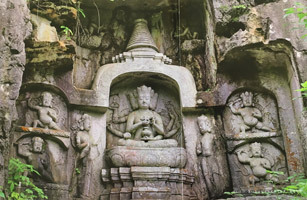 A stūpa with the central deity within is flanked by two pairs of deities that are depicted similarly to the Uṣṇīṣavijayā group, one above the other. Fig. 11 A Xi Xia version of a Uṣṇīṣavijayā maṇḍala can be seen in the same cave 3 at Yulin. This example also shows a combination of Tibetan and Chinese modes. The goddess and wrathful guardians are in the Tibetan mode, while the Bodhisattvas and the divinities on the clouds are shown in the Chinese mode (Fig. 11). The Feilaifeng and Yulin Uṣṇīṣavijayās are clad only in a lower garment; they are graced with prominent crowns, large round earrings, various bracelets and sets of long and short necklaces. Both are seated on almost identical high thrones, which consist of lotus seats with one row of petals and a multi-tiered base (Fig. 12). Fig. 12Generally speaking, the Tibetan mode figures at Feilaifeng exhibit a mix of Indian Pāla and Chinese stylistic characteristics. The figures have large heads with full, U-shaped faces with Chinese features. Although the underlying skeletal structure seems relatively slender, the bodies are fleshy, even plump. Their torsos are elongated, their shoulders narrow, sloped, and soft. Normally, slender skeletal structure tends to indicate late Pāla Indian stylistic roots, while plump bodies, and elongated torsos with sloped, soft shoulders are typically Chinese characteristics. In contrast, the Nepalese mode of the 13th -14th centuries is usually exemplified by round or heart-shaped faces, somewhat squat proportions, and muscular torsos with wide shoulders. None of these features are seen at Feilaifeng. The jewellery depicted on the Feilaifeng sculptures in the Tibetan mode differs only slightly from figure to figure. The set of adornments normally includes a crown with five leaves, large round earrings, an array of short and long beaded necklaces and beaded bracelets – often with circular decorations – on the arms, wrists, and ankles. The long necklaces are simple and string-like in shape; the short necklaces are more elaborate, with various beaded swags and pendants. In his study of Feilaifeng sculptures, Lai Tianbing underscores that necklaces with swags were a widespread artistic convention and can be seen in works of various styles and from various areas. Fig. 13This type of ornaments and the extensive use of beading, generally speaking, indicate Indian Pāla stylistic roots. However, it recalls more specifically Xi Xia imagery. For example, the deities in cave 465 at Mogao are adorned in a similar fashion. The modelling of some figures is very close as well. The stone depiction of Jambhala at Feilaifeng and the painted representation of Ekajaṭī in cave 465 are particularly representative (Fig. 13). They have similar facial features and body proportions. Both wear large round earrings, swagged necklaces and beaded bracelets on their wrists and ankles. The Jambhala wears arm bracelets with a large central petal and two surrounding branches. These bracelets are a feature found in imagery of later date than that in cave 465; similar bracelets were popular in Tibetan art in the 13th-14th centuries and are found in works done in different styles. All of the Xi Xia examples I have discussed are datable to the second half of the 12th century. More relevant comparisons can be made with a painting from Hexi attributed to the late Xi Xia or early Mongol period (Fig.14). 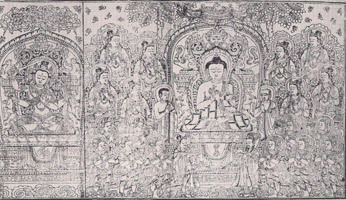 The figures of the five celestial Buddhas at the top of the painting are depicted in a style, similar to that of the Feilaifeng Akṣobhya in Fig. 15 (See comparison in Fig. 16). The Feilaifeng figure, however, has a significantly heavier build that betrays its Chinese provenance. 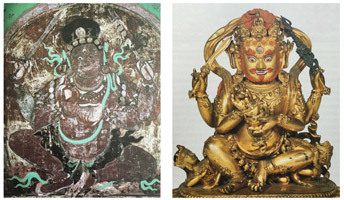 One peculiar feature found at Feilaifeng is that Saḍakṣarī Avalokiteśvara and Uṣṇīṣavijayā are both depicted in two versions, as a Chinese deity and as a Tibetan deity. Similarly, they are found in both Chinese and Tibetan versions in Xi Xia art. To conclude, the harmonious integration of Tibetan and Chinese modes and the strong stylistic and thematic similarities with art from Hexi confirm the continuation of the Xi Xia artistic tradition at Feilaifeng. This tradition was probably promoted in South China by the group of influential Tangut monks in the Buddhist administration. Hangzhou was an important printing centre in South China from at least the 10th century. Three Buddhist canons were printed there during the Yuan. The Puning Canon was mostly completed by 1290. The so-called Hexi Canon, written in Tangut, was printed by 1302. Finally, the Qisha Canon was largely completed by 1322. The printed editions of these three canons included texts with illustrated frontispieces. These illustrations show imagery associated with Tibetan Buddhism. The above-mentioned group of Tangut Buddhist monks who occupied high-ranking positions within the Yuan Buddhist administration promoted the production of these canons. The prominent figures behind this enterprise were the Tanguts Yang Lianzhenjia, Guan Zhuba, and Shaluoba. Yang Lianzhenjia is known as the benefactor behind the Qisha Canon. Shaluoba (1259-1314), a renowned translator and an interpreter for Qubilai Khan, held high positions in the Buddhist administration of Fujian area and Jianzhe province in South China from 1295 to 1301. He is credited with the translation of Tibetan texts into Chinese for both the Puning and Qisha canons. Guan Zhuba, Shaluoba’s successor in the South, for his part, set up a printing office in Hangzhou and sponsored the production and distribution of the Qisha and Hexi canons between 1302 and 1306. He was also responsible for the addition of ninety Tibetan esoteric texts to the Qisha canon. As suggested by Lucille Chia, Guan Zhuba’s activities were not limited to printing and distribution, but rather also aimed at inducting Tibetan texts into the Chinese canons. The frontispieces used to illustrate these canons are particularly relevant for the study of Yuan Buddhist art. All of them are datable to the first decade of the 14th century. A remarkable feature is the recurrent use of the same kinds of templates in the design of the frontispieces for all three canons, a repetition that can be explained, as these editions were all produced in the same facilities in Hangzhou. 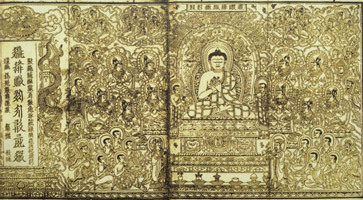 As an example, the Buddha preaching template was used in the frontispieces for the Qisha canon (Fig. 17) and the Yuan edition of the Hexi canon in the Tangut language (Fig. 18). Ten different kinds of templates have been identified. Nine templates out of ten display a combination of Chinese and Tibetan modes. Similar templates with a mixture of Chinese and Tibetan subjects are also found in the sutra frontispieces produced in Xi Xia. The cover illustrations in figures 17 and 18, for instance, appear to follow the composition of the Xi Xia frontispiece dated to 1186 in figure 19. Comparing the three, the Yuan frontispieces demonstrate more elaborate throne back arches with scrolling foliate tails. This design became widespread in the Tibetan world by 1300, and can be found in both Indian Pāla and Nepalese style paintings. However, the strictly horizontal lintel ends of these throne backs indicate Indian Pāla stylistic roots for the frontispieces. Discussing these frontispieces, Shih-shan Susan Huang argues that their strong visual connection with Xi Xia material suggest “the Yuan appropriation of Xi Xia art”. She also notes that the figures and garments in the Yuan frontispieces look more Chinese than in the Xi Xia prototypes. According to her, local Chinese artists were probably given the Xi Xia originals to copy, but rendered the figures in accordance with local Chinese aesthetics. In contrast, Jane Casey is of the opinion that the faces in the frontispiece for Qisha canon in figure 20 display “essentially Nepalese physiognomy,” which she ascribes to “the Sino-Himalayan style developed by Anige and his atelier”. In my view, however, the frontispieces display Hexi aesthetics of the late Xi Xia and early Mongol periods. The figures in the Yuan frontispieces have large heads, distinctive faces with closely placed facial features and high foreheads. Similar facial type can be found in the Hexi painting in figure 14 (see comparison in figure 21). Figure 22 presents a comparison between the faces of two major figures in the Qisha frontispiece discussed by Casey (Fig. 20) with faces taken from Khara Khoto paintings on the left and from Nepalese paintings on the right. The Khara Khoto material displays striking similarities: the faces are elongated, mouths large and the chins heavy. The Nepalese faces with their distinctive small mouths and small protuberant chins represent a totally different physiognomic type. One may finally observe that the names of some of the illustrators have come down to us. While it is difficult to determine the origin of these artists, they all bear traditional Chinese names and we cannot exclude the possibility that some of them were from Hexi. The former capital of the Southern Song dynasty Hangzhou was the largest city in the Yuan China. It had a long history of Buddhist printing that encouraged the Yuan rulers’ decision to express their Buddhist devotion by patronising the production of these three canons (i.e. Hexi, Puning, and Quisha) there. However, the printing of the Hexi canon in the Tangut language and the introduction of Tibetan material into the Chinese canons (Puning and Qisha) represent a continuation of a Xi Xia Buddhist tradition characterized by the massive printing of both Chinese and Tibetan religious texts. In this regard, the multilingual monks from Hexi were the most suitable supervisors for the Yuan projects. They incorporated Tibetan esoteric material into the Chinese canons and contributed to the diffusion of artistic language and visual elements from Xi Xia. In turn, the prints from Hangzhou, with their richly decorated frontispieces, were widely distributed resulting in the further dissemination of Xi Xia-style imagery in China during the Yuan. Fig. 23A figure of Mañjuśrī from the Palace Museum belonging to the Tibetan tradition can be securely attributed to Yuan China (Fig. 23). A dedicatory inscription in Chinese characters was engraved on the bottom plate of this sculpture. It indicates that a donor named Gao Quanxin, together with his family, had commissioned this image to express their gratitude to their parents. The sculpture is dated to the fifteenth day of the fifth month of the ninth year of Dade’s reign (1297 – 1307), a date corresponding to the year 1305. This figure of Mañjuśrī has been believed to epitomize the Nepalese artistic tradition in China and is often attributed to the hand of Anige or his school. However, the private nature of the inscription implies that the piece was not produced at the Yuan imperial workshops and thus is unlikely to be associated with Anige. It is unclear, however, how and when it entered the Qing court collection. Elongated slender torsos; narrow sloped shoulders; large heads, U-shaped faces, high foreheads, narrow downcast eyes, heavy eyelids, relatively large mouths with accentuated lower lip, subtle smiles. Bodhisattvas adorned with leaved crowns with 5 leaves in the front and often 3 additional leaves in the back; a long necklace made of two strings of beads; an elaborate short necklace comprised of strings of larger beads and stones in distinctive round settings – sometimes with various swags and pendants; large round earrings and bracelets echoing crown elements; a belt decorated with swags and pendants. Lotus bases consisting of two rows of distinctive lotus petals. On some figures, Chinese decorative scrolls on garments as often found in the art of Song, Xi Xia, and in other Yuan decoration (see the garment decorations in fig. 24, 26). The characteristics listed above are largely consistent with the art of Feilaifeng and the Hangzhou sutra frontispieces. They represent a mix of Indian Pāla and Chinese artistic traditions. As mentioned earlier, the Palace Museum Mañjuśrī and the whole group associated with it have been attributed to a Nepalese style-based Yuan tradition. However, a comparison with material in the typical Nepalese style shows more differences than similarities. A small figure of Mañjuśrī from the author’s collection (Fig. 25) exemplifies the Nepalese work in Tibet contemporary with the Yuan dynasty. It displays a powerful and somewhat squat body as opposed to the elongated and slender Yuan figures. The face is rounder, the eyelids are not heavy, the eyes themselves are much wider, and the mouth is much smaller. The crown is also entirely different. The Yuan leaved crowns are not seen in Nepalese style imagery. The crown, armlets and anklets worn by Manjusri in figure 25 display typically curvilinear Nepalese design. In contrast, the treatment of the armlets and anklets worn by the Yuan figures (fig.23, 24) is much simplier and echoes the design of their leaved crowns. A comparative analysis of two Buddha images further demonstrates substantial differences between the two styles. The body proportions and facial features of a stylistically representative 13th-14th century Nepalese Buddha from the author’s collection (Fig. 27) are significantly different from those of a Yuan dynasty Buddha from the Robert Bigler collection (Fig. 26). 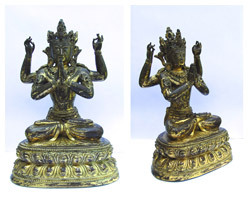 In addition, the Yuan figures are not made of copper, the traditional Nepalese medium. Their alloy composition has not yet been analysed, but visual examination suggests the metal is very similar to the brass used in Yongle sculptures. 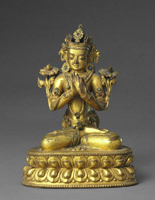 While the Yuan sculptures seem at a significant distance from their Nepalese counterparts they show a closer affinity with Tibetan sculptures in the style based on the late Pāla Indian style (Fig. 28). 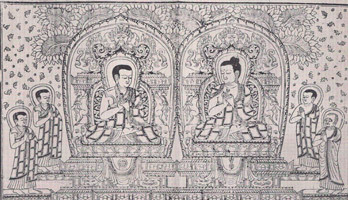 The Tibetan (fig.28) and Yuan bodhisattvas (fig.23, 24), for instance, have relatively large heads, slender bodies, and wear similar leaved crowns. However, the Yuan figures display somewhat Chinese facial features and have elongated torsos, they wear jewellery inlaid with stones. Their lotus bases are also very different from the Tibetan example. Sculptures retrieved from former Xi Xia territories and from the Mongolian capital of Karakorum provide stronger comparisons. Included in these are two Buddha heads excavated from the site of the great stūpa temple in Karakorum and datable to the foundation period between 1235 and 1256. Their facial features show remarkable similarities to those in the discussed Yuan figures: U-shaped faces, narrow eyes with heavy eyelids, fleshy lower lips, and subtle smiles (Fig. 29). The lotus bases of the clay sculptures found at Karakorum (Fig.30) are also similar to those of the Yuan figures. 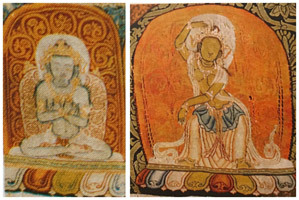 The folds at the bottom hem of the Buddha’s robe visible on the lotus cushion in the Karakorum piece (Fig.30) are rendered exactly like those in the Yuan sculptures in figures 24 and 26. As discussed in the historical introduction section, German archaeologists have observed important artistic connections between artefacts found in Karakorum and those from Khara Khoto in Hexi that might be explained by the fact that many Xi Xia artisans were deported to Mongolia after the conquest in 1227. The metal sculptures excavated from former Xi Xia lands attest to a well-developed casting school. Unfortunately only a very few examples in the Tibetan tradition have survived. The Buddha and bodhisattva metal statues in figures 31 and 32 were excavated from the Khara Khoto area. They display a combination of Indian Pāla and Chinese stylistic elements. Their large heads, closely placed facial features, elongated torsos with long powerful arms are characteristics of late Xi Xia imagery and can be usefully compared to those in an important Xi Xia painting from the Wuwei Provincial Museum, which probably depicts a Xi Xia emperor venerating Bodhisattva Mañjuśrī (Fig. 33). The Yuan sculptures demonstrate the development of this style as can be recognized in the high foreheads, heavy eyelids and distinctive accentuated lower lips as well as the elongated torsos with sloped shoulders and stylistically similar leaved crowns and necklaces. Fig. 34A unique sculptural representation of Saḍakṣarī Avalokiteśvara from the author’s collection provides more compelling evidence for the Xi Xia origin of the Yuan style (Fig. 34). The figure shows a transition from the style exemplified in the Xi Xia sculptures in figures 31 and 32 to the style of the Yuan sculptures in figures 23 and 24. Its distinctive facial features, elongated torso and long and full arms are close to those in the two Xi Xia sculptures illustrated (Fig. 31 and 32) and in the Wuwei painting (Fig. 33). Furthermore, the iconographic representation of this deity is significantly distinct from traditional depictions of four-armed Avalokiteśvara and can only be found in visual material from Xi Xia. A striking characteristic of this iconographic type is the position of a second pair of arms lifted up at almost right angles at the elbows. A similar depiction of Avalokiteśvara is found in the Xi Xia wall painting of cave 5 at the Eastern Thousand Buddha Caves (Ch. Dong Qianfodong) in Hexi (Fig. 35). 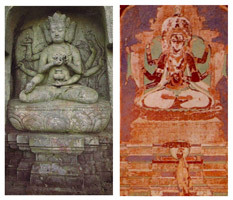 The central deity and two attendants hold their arms in the same fashion. They also display an interesting hairdo, a tall conical coiffure topped with a distinctive ornament. This particular hairstyle is also found in the sculpture. The way of presenting the second pair of arms probably had a local origin as a similar handling of the arms of another four-armed form of the deity, sometimes called Sun - Moon Avalokiteśvara, is found in Hexi (see a deity in the lower right corner in fig. 41). Likewise the design of the crown also seems to be of local origin. An analogous crown is found in a 10th century Dunhuang banner from the Metropolitan Museum of Arts (Fig. 36). The Yuan figures (Fig. 23, 24) wear crowns of the same type as the Xi Xia Saḍakṣarī Avalokiteśvara crown. The design of the leaves in the Yuan crowns, however, is flat and more stylized. The set of necklaces seen in the Xi Xia Saḍakṣarī Avalokiteśvara is close to those in the late Xi Xia painting in Fig. 14 (see the details in Fig. 37) and consists of a long beaded necklace and short necklaces with beads, stones in round settings, and swags. Similar necklaces are seen in the Yuan figures (Fig. 23, 24), though it is more elaborate in figure 24. The unique iconography of the Saḍakṣarī Avalokiteśvara clearly attests to its Xi Xia origin. The style is distinctive and may be classified within late Xi Xia imagery. This same style is recognized in the Yuan sculptures, where, however, it shows a certain development. The faces had become more refined, the bodies leaner and the ornaments more elaborate. This trend would later reach its peak in the Yongle style. 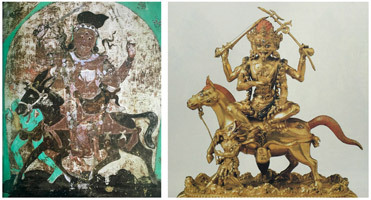 Relying on these considerations, I would contend that the statue of Mañjuśrī from the Palace Museum and the group of similar Yuan pieces should be seen as a continuation of the tradition developed in Hexi under Xi Xia rule and not as examples of a Nepalese style-based tradition as has been repeatedly proposed. Fig. 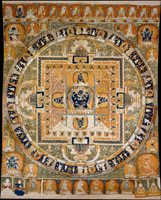 38A magnificent woven thangka depicting a Vajrabhairava maṇḍala was likely produced by the Yuan imperial workshops (Fig. 38). This impressive silk tapestry (kesi) was commissioned by the Emperor Shundi (r. 1333-68) together with his brother Khoshila and their spouses, who are depicted as donors in the lower corners. The history of its creation is not known, but the presence of these four people allows for the attribution of this image to the imperial workshops, sometime between 1330 and 1332. This image has been extensively published with the most complete historical background and technical analysis to be found in the Metropolitan Museum exhibition catalogue When Silk Was Gold. Central Asian and Chinese Textiles (1997). The Tangut monk and translator Shaluoba, who contributed to the production of the Yuan Buddhist canons in Hangzhou, is responsible for the introduction of the Vajrabhairava cult to China. A Vajrabhairava image depicted in a wall painting in Xi Xia cave 465 at Dunhuang constitutes perhaps one of the earliest representations of this tutelary deity in the art of Tibetan Buddhism (Fig. 39). A brief comparison of these two images shows the same body modelling and distinctive tilting of the head, with its grinning facial expression. Both deities are adorned with analogous beaded and swagged necklaces. As for the other deities and human figures represented in the kesi, their appearance is consonant with the Hexi stylistic traits observed earlier in the Yuan material: large heads, U-shaped faces with high forehead and closely placed features, elongated torsos, and narrow sloped shoulders (Fig. 40). It is also important to note that the kesi technique was associated with the Uighur tradition. This is testified to by the fact that the places of kesi production coincided with the presence of Uighur population. The popularity of the kesi technique in Xi Xia could be explained by the presence of a large Uighur population in Xi Xia territories as well. The colour scheme of the kesi, with its extensive use of green and ochre is also representative of the aesthetics typical for Hexi and is in sharp contrast to the red-based colour palette found in Nepalese maṇḍalas. These colours and the use of elaborate scrollwork with various flowers on a dark background are often seen in Xi Xia art. For example, similar flower scrolls densely fill the background in the wall paintings of cave 4 at Dong Qianfodong and in many thangkas from Khara Khoto (Fig. 41, 42). Various flowers encircled by intertwined vines are normally associated with the Indian Pāla style. The silk image of the Vajrabhairava maṇḍala is of the utmost importance for the history of art in Yuan China. This imperially commissioned thangka not only demonstrates what likely constituted the religious taste and artistic trend at the Yuan court, but also clearly attests to the persistence of themes and stylistic features reminiscent of the art from Xi Xia. One is therefore tempted to question once again the professed influence of Nepalese aesthetics in Yuan Buddhist art, as it is essentially absent from this emblematic work. The Juyongguan platform, with its magnificent bas-reliefs, is undoubtedly the pinnacle of Yuan Buddhist art (Fig. 43). Located some fifty kilometres to the north of the Yuan capital Dadu (i.e. Beijing), the monumental white marble platform was commissioned by the last Emperor of the Yuan Dynasty and completed in 1354. Three stūpas originally graced this edifice but were destroyed by fire. Jiro Murata and Akira Fujieda conducted the most comprehensive study of this monument in 1957. 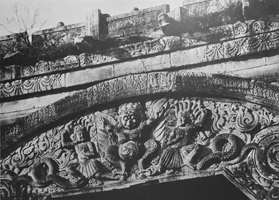 The external façade of the platform is adorned with a toraṇa-like arch featuring the six mythical creatures (e.g. Makaras, Nāgas, Garuḍa), known in the Tibetan world as the ‘six supports of the throne back’ (Tib. khri rgyab drug ’gyogs). The whole composition is filled with outward scrolling of foliated Makaras tails and traditional Chinese clouds (Fig. 44). As discussed earlier, this scrolling composition finds its origin in India. It eventually became a ‘pan-Tibetan artistic convention’ observed in works done in both the Nepalese and Indian Pāla styles. This notwithstanding, the composition is adapted to the Chinese taste by the inclusion of Chinese cloud motives and by giving the figures Chinese features. The platform’s passageway is also richly decorated. Four guardian deities (Skt. lokapāla) executed in the Chinese mode watch over the two entrances (Fig. 45). Inside, a section of the wall is filled with inscriptions executed in six different languages: Sanskrit (i.e. rañjanā script), Chinese, Mongolian (i.e. Phagpa script), Tibetan, Uighur, and Tangut. Various protective formulae, such as the Uṣṇīṣavijayā and Tathāgatahṛdaya dhāraṇīs, are inscribed in large letters. Other inscriptions in small letters contain a religious eulogy of the monument. In addition, a ‘poetic summary’ of Tathāgatahṛdayasūtra is given in Chinese and Tangut only that clearly reflects the depth of Xi Xia Buddhist authority in Yuan China. 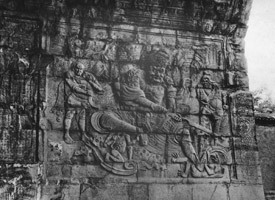 The two inclined walls of the passageway are carved with large representations of the Buddhas of the ten directions, five on each side (Fig. 46). Each Buddha is in turn surrounded by one hundred and two small Buddha figures representing the one thousand Buddhas of the bhadrakalpa. The depiction of these thousand Buddhas is a well-known subject in Chinese Buddhist art and can already be seen as early as the Northern Wei Dynasty (386 - 534). The Buddhas of the ten directions are seated on multi-storey thrones with elaborate backrests. Similar representations are known in Chinese sculptural art from at least the Tang Dynasty. The Jin Dynasty Buddha sculptures at Shanhua Temple (1128 – 1143) in Shanxi province offers particularly close comparisons (Fig. 47). At Juyongguan, however, the decoration on the backrests is depicted in the Indian Pāla style, with scrolls composed of various flowers within circular frames. Significantly, the flowers themselves, however, are depicted in the Chinese manner. This type of scrollwork is also used in the inner edges of the passageway and in the balustrades on top of the platform (Fig. 48). Fig. 50Finally, five maṇḍalas in the tradition of Tibetan Buddhism are carved on the ceiling inside the passageway. 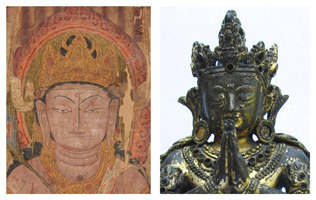 According to the Mongolian and Uighur inscriptions, they represent the maṇḍalas of Akṣobhya, Vairocana, Vajrapāṇi, Amitābha, and Buddha Śākyamuni (Fig. 49). ) Their iconography and the reason why they were chosen to adorn this building are not fully understood. 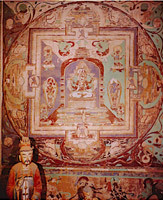 Although figures in the mandalas follow the style found in the previously discussed thangka from Dunhuang in Hexi (Fig. 14) and at Feilaifeng (Fig. 15), they already exemplify later characteristics of the Yongle and Xuande periods, such as the flower rosettes in the crowns, Chinese faces, necklaces with two large swags and long central pendants, and distinctive scarves (see comparisons in Fig. 50). The Juyongguan Platform combines the hallmarks of Chinese Mahayana and Tibetan Vajrayana Buddhism. The eclectic blend of artistic features in this imperially commissioned building attests to the continuation of the Xi Xia artistic tradition and to the syncretic nature of Yuan Buddhism subject to various cultural and religious influences. This brings to an end our overview of the most significant Yuan dynasty works influenced by Tibetan Buddhism. Taken together, the monuments and works of art under review in this article show a high degree of stylistic similarity. In all the cases presented, the dominant traits of this artistic tradition suggest that these works were greatly influenced by art from Hexi, an area controlled by Tanguts before the Mongol takeover in 1227. At the same time, as was shown earlier, Yuan Sino-Tibetan art displays some decorative motives (e.g. swagged necklaces, elaborate throne back arches), which became widespread artistic conventions in the 13th-14th centuries and can be found in works based on different styles (e.g. Indian Pāla, Nepalese) and produced in different regions. Their presence attests to the position of Yuan China within a larger picture of cross-cultural interactions in the realm of Tibetan Buddhism. The Nepalese style-based artistic tradition was not recognized in the discussed material, and it is certain that if this tradition ever existed in Yuan China it was not prominent in the Yuan art. In 1368 the short-lived Mongol dynasty was overthrown by rebel forces and Han Chinese rule was restored under the Ming Dynasty (1368 – 1644) by the self-proclaimed Emperor Hongwu (r. 1368 – 1398). According to Herbert Franke, antagonizing actions by Buddhist clergy of Tibetan tradition, who were given enormous power in China and treated with preference over Chinese Buddhists, played a key role in the rise of nationalistic and anti-foreign feelings among the Han Chinese population. This resentment in turn resulted in a mass destruction of the cultural heritage associated with Mongol rule after the collapse of the dynasty. Perhaps somewhat surprisingly given this, the Yongle (1403-1424) and Xuande (1425 – 1435) Emperors of the Ming dynasty continued the patronage of Tibetan Buddhism in the early 15th century. In recent works Robert Bigler and Phillip Adams have illustrated the development of the Yongle Buddhist sculptural style growing out of what had been achieved during the Yuan. However, this can be expanded on. Probably the most important feature of Yongle sculptural art is an absolute stylistic unification of the Tibetan and Chinese pantheons, a phenomenon, which originated in Xi Xia art and was developed during the Yuan. The Feilaifeng sculptures are a very good example of this trend. There is a common view in the art-historical literature that Yongle Buddhist sculptures were associated exclusively with Tibetan Buddhism. Many of these works, however, represent iconographic types that are not seen or are not popular in Tibet. Rather, their sources can be found in Chinese Buddhist art and in Xi Xia Buddhist art. For example, Michael Henss has demonstrated that a Song dynasty Guanyin sculpture from the Guimet Museum provides a possible prototype for a Yongle figure from the Potala Palace collection and other almost identical Yongle figures. Similarly, a standing Yongle era Buddha formerly in the Speelman collection represents an extremely popular Chinese icon - the Sandalwood Buddha. A Yongle image of Kṣitigarbha Bodhisattva sold at China Guardian auction in 2013 is another example of Chinese Buddhist iconography. A magnificent Yongle Buddha Shakyamuni figure in the British Museum collection (museum number 1908,0420.4) is also depicted in the Chinese mode. The Buddha is seated on a multi-tiered throne with an elaborate backrest comparable to those in the Yuan and Jin examples (fig. 46 and fig.47 respectively). Additional Yongle sculptures represent iconography associated with Chinese Buddhism as well. Some distinctive iconographic and stylistic models for Yongle and Xuande works are recognized in Xi Xia art. 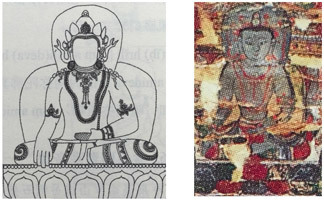 The stylistic development of the Hexi imagery into the Yuan and early Ming models was already illustrated on the example of Buddha Akṣobhya depictions in figure 50. 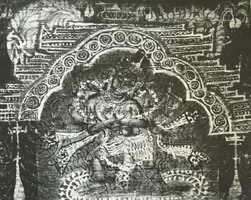 In addition, the earlier evolution of a Yongle depiction of Vajrabhairava image as seen in figure 51 is shown in figure 52. The Yuan and Ming images generally follow the model from Hexi. Similar depictions are not found in Tibetan art earlier than the 15th century. 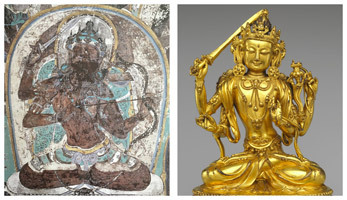 Representations of Four-armed Mañjuśrī, Caturbhuja Mahākāla, and Sri Devi from the Yongle reign also can be compared to those in Xi Xia cave 465 in Mogao (Fig. 53, 54, 55). The Xi Xia figures are modelled in the Indian Pāla style, but the interpretation of this style is significantly different from that found in the art of Central Tibet. The bodies of the Xi Xia figures look soft and relaxed, their shoulders sloped, their gestures effortless, even somewhat weak in a manner that altogether recalls Chinese imagery. The same features are exaggerated to the point of mannerism in the Yongle sculptures. The second pairs of arms in the Xi Xia images hold a sword or other attributes in a distinctively relaxed manner, something clearly recognizable in the Yongle images as well. Two Xuande sculptures, formerly in the Speelman collection, represent dancers as often found in Xi Xia art (see comparison in Fig. 56). These dancing figures can be seen in the bottom part of the composition in cave paintings and thangkas from Hexi (see examples in figures 14, 42, 57). A row of similar dancing figures is often placed at the bottom of Yongle thangkas as well. See, for example, the Vajrabhairava Yongle thangka shown in figure 51. This feature has a Hexi origin and is uncommon in the art of Tibet. Other stylistic and technical features that highlight the persistence of the Xi Xia tradition in Yongle thangkas were discussed by Juliane Nosh in a recently published essay. The stylistic considerations shown in this study demonstrate that Yuan and early Ming Sino-Tibetan art are an evolution of the artistic tradition developed in Hexi under Xi Xia rule, not of that of Nepal and Tibet. This conclusion well corresponds to the key role that Xi Xia Buddhist culture played in the Mongol appropriation of Buddhism and the dissemination of Tibetan teachings in Yuan China. Due to our fragmentary knowledge about the nature of Buddhism under the Mongols, the legacy of Xi Xia in Yuan and early Ming Buddhist art has been largely overlooked in the art historical literature. Yuan dynasty Tibetan Buddhist imagery was instead associated with the Nepalese artistic tradition allegedly established at the imperial workshops by Anige. Although never confirmed, this idea still dominates popular views. The Mongols evidently followed the Xi Xia example in their enormous expenditure on religious paraphernalia and art. These objects along with other valuables (luxurious Mongol clothing, silk textiles etc.) were donated to Tibetan lamas as a reward for performing rituals and teachings. In Tibet these pious donations became a sign of prestige and association with the imperial power. Gradually Yuan aesthetics became more popular in Tibetan art, and an increasing presence of Chinese stylistic elements is seen from the 14th century onwards. Many different terms are used to describe the style of Yuan period Sino-Tibetan art, Tibeto-Chinese, Nepalo-Chinese, Sino-Tibetan, Sino-Himalayan, Nepali-based, Indo-Himalayan and so on. Some of them are simply wrong or misleading, others are too imprecise. In my turn, I would suggest a new term, “Hexi style” or “Xi Xia style”, that would highlight both the complex nature of the style and its geographical origin. More detailed studies of Xi Xia culture and its legacy in China and in Tibet are needed. The author hopes that such research will be encouraged by the present contribution. This research paper has benefitted from various discussions and input. I would like to extend my gratitude to Luo Wenhua, Stephen Haw, Hon Wai Wai, David Pritzker and especially Ian Alsop. I sincerely thank Ed Hunter for his enthusiastic help, invaluable editing recommendations and meticulous corrections. My primary debt of gratitude must go to Yannick Laurent for his relentless support and encouragement to write this contribution, as well as for his suggestions and for converting my English into proper English. Adams, Phillip. ‘Imperial Yuan Gilt-Metal Buddhist Sculptures: Stepping Stones to the Early Ming’, Orientations; Volume 45, number 8 (Nov/Dec 2014): 92-100. Artwood, Christopher P. ‘The First Mongol Contacts with the Tibetans.’ in Roberto Vitali, Gedun Rabsal, Nicole Willock ed. Trails of the Tibetan Tradition: Papers for Elliot Sperling, Special issue Revue d'Études Tibétaines, 31 (Fevrier 2015): 21-45. Brauen, Martin. Maṇḍala: Sacred Circle of Tibetan Buddhism. New York: Rubin Museum of Art, 2009. Bigler, Robert. Art and Faith at the Crossroads: Tibeto-Chinese Buddhist Images and Ritual Implements from the 12th to the 15th Century (with an essay by Béla Kelényi). Zurich: Garuda Verlag, 2013. Bigler, Robert. Before Yongle: Chinese and Tibeto-Chinese Buddhist sculpture of the 13th and 14th Centuries (with an essay by Béla Kelényi). Zurich: Garuda Verlag, 2015. Brook, Timoty. The Troubled Empire. China in the Ming and Yuan Dynasties. Cambridge; London: The Belknap Press of Harvard University Press, 2010. Bukharin, M.D. “Pisma P.K. Kozlova S.F. Oldendurgu iz Sobrania PFA RAN.” Problemy Isorii, Filologii, Kultury 4(38), (2012), 288-304. Casey, Jane. Buddhist Initiation Paintings from the Yuan Court (1271-1368) in the Sino-Himalayan Style, 16 June 2014, http://www.asianart.com/articles/tsakli-casey/index.html (Accessed 11.06.2016). Carter, Marc. et al. Empires Beyond the Great Wall : The Heritage of Genghis Khan. Los-Angeles: Natural History Museum of Los Angeles County, 1993. Chandra, Lokesh. and Nirmala Sharma. Buddhist Paintings of Tun-Huang In the National Museum, New Delhi. New Delhi: Niyogi Books, 2012. Chang Qing. ‘The Portrait of Yang Rinchen Skyabs at Feilaifeng of Hangzhou and Its Reception in the Yuan and Ming Periods’ in Xie Jisheng et al. Jiang Nan Zang Chuan Fo Jiao Yi Shu [Tibetan Buddhist Art in the South of Yangtse River: Studies on the Buddhist Stone Carvings at Feilai Feng, Hangzhou] (Beijing: Zhong Guo Zang Xue Chu Ban She [China Tibetology Press], 2014): 423-460. Chia, Lucille. ‘The Life and Afterlife of Qisha canon (Qishazang)’, in Jang Wu and Lucille Chia, Spreading Buddha's Word in East Asia: The Formation and Transformation of the Chinese Buddhist Canon (New York: Columbia University Press, 2016): 201-238. Davidson, Ronald M., Tibetan Renaissance. Tantric Buddhism in the Rebirth of Tibetan Culture. New York: Columbia University Press, 2005. Du Zheng. et al. ed. Mountain Geoecology and Sustainable Development of the Tibetan Plateau. Dordrecht; Boston: Kluwer Academic Publishers, 2000. Dunnell, Ruth. ‘The Hsia Origins of theYuan Institutionof Imperial Preceptor’, Asia Major 3rd ser., 5:1 (1992): 85-111. Dunnell, Ruth. ‘Translating History from Tangut Buddhist Texts’, Asia Major, third series, vol. 22, part 1 (2009): 41-78. Dunnell, Ruth. ‘Esoteric Buddhism Under the Xixia (1038–1227)’ in Charles Orzech, Henrik Sorensen, and Richard K. Payne, ed., Esoteric Buddhism and Tantras in East Asia (Leiden: Brill, 2011): 465-471. Elikhina, J.I. Some Archaeological Findings of the Mongolia-Soviet Expedition Led by S.V. Kiselev: Karakorum Settlement Relics Stored in the Hermitage Museum. Osaka: National Museum of Ethnology, 2014. Fitzhugh, William et al. and eds. Genghis Khan and the Mongol Empire, New York: W.W Norton & Company, 2013. Franke, Herbert. ‘Tibetans in Yuan China’, in John D. Langlois Jr. ed. China Under Mongol Rule, (Princeton: Princeton University Press, 1981): 296-328. Franke, Herbert. ‘Sha-Lo-Pa (1259-1314), A Tangut Buddhist Monk in Yuan China’ in Gert Naundorf et al. and eds., Religion und Philosophie in Ostasien: Festschrift für Hans Steininger zum 65. (Würzburg: Königshausen & Neumann, 1985): 201-222. Gray, David. ‘Tibet and the Continent the Tenth to Thirteenth century’ in Charles Orzech, Henrik Sorensen, and Richard K. Payne, ed., Esoteric Buddhism and Tantras in East Asia (Leiden: Brill, 2011): 451-455. Gutschow, Niels. The Nepalese Caitya: 1500 Years of Buddhist Votive Architecture in the Kathmandu Valley. Stuttgart: Menges, 1997. Haw, Stephen. ‘Semu Ren in The Yuan Empire’, Ming Qing Yanjiu [XVIII] (2013-2014): 39-63. Heller, Amy. Tibetan Art, Tracing the Development of Spiritual Ideals and Art in Tibet, 600-2000 A.D., Milano: Jaca Book, Antique Collector’s Club, 1999. Heller, Amy. Tracing the Reception and Adaptation of Foreign Aesthetic Elements in Tibetan Sculpture, 20 September 2006, http://asianart.com/articles/aesthetics/index.html (Accessed 17.06.2016). Huttel, Hans-George. ‘Der Palast des Ögedei Khan - Die Ausgrabungen des Deutschen Archäologischen Instituts im Palastbezirk von Karakorum [The Palace of Ögedei Khan - The Excavations of the German Archaeological Institute in the Palace District of Karakorum]’, in Dschingis Khan und Seine Erben, Das Weltreich der Mongolen [Genghis Khan and His Heirs, the Empire of the Mongols]. (München: Hirmer, 2005): 140–146. Jackson, David. The Nepalese Legacy in Tibetan Painting. New York: Rubin Museum of Art, 2010. Jackson, David. Mirror of the Buddha: Early Portraits from Tibet. New York: Rubin Museum of Art, 2011. Jing, Anning. ‘The Portraits of Khubilai Khan and Chabi by Anige (1245-1306): A Nepali Artist at the Yuan Court.’ Artibus Asiae, Vol. 54, No. 1/2 (1994): 40-86. Jing, Anning. ‘Financial and Material Aspects of Tibetan Art Under the Yuan Dynasty.’ Artibus Asiae, Vol.64, part 2 (2004): 213-240. Karmay, Heather. Early Sino-Tibetan Art. Warminster: Aris and Phillips Ltd., 1975. Komroff, Manuel. ed. The Travels of Marco Polo. New York: The Modern Library, 1926. Kossak, Steven M. and Jane Casey Singer. Sacred Visions Early Paintings from Central Tibet, 1998. Kujip van der, Leonard. “Baysi and Baysi-s in Tibetan Historical, Biographical and Lexicological Texts”, in Central Asiatic Journal 39/2:275-301. Kychanov, E. I., Ocherki Istorii Tangutskogo gosudarstva [Essays on the History of the Tangut state]. Moscow: Nauka [Scince], 1968: 327. Kychanov, E. I. ‘The Tangut Hsi Hsia kingdom (982-1227),’ in M.S. Asimov and C. E. Bosworth, ed. History of Civilizations of Central Asia, Vol. IV. The Age of Achievement: A.D. 750 to the End of the Fifteenth century. Part One. The Historical, Social and Economic Setting, (Paris: UNESCO, 1998): 212-220. Kychanov, E. I., ‘The State and the Buddhist Sangha: Xixia State (982-1227)’, The Journal of Oriental Studies (Tokyo) 10 (2000): 119-128. Kychanov, E.I. Isstoria Tangutskogo Gosudarstva [History of the Tangut State]. St.Persburg: Fakultet Filologii i Iskusstv St. Peterburgskogo Gosudarstvennogo Universiteta [The Faculty of Philology and Arts of the St. Petersburg State University], 2008. Lai Tianbing. Han Zang Gui Bao [Treasures of Sino-Tibetan art: A Study on the Sculptures at Feilaifeng in Hangzhou]. Beijing: Wenwu Chubanshe [Cultural Relics Publishing House], 2015. Lee, Sherman, and Wai-kam Ho, Chinese Art Under the Mongols: The Yuan Dynasty (1279-1368). Cleveland: Cleveland Museum of Art, 1968. Lei Runze, ‘The structural Character and Tradition of Ningxia’s Tangut stūpas’, Orientations, (April 1996): 55-62. Leidy, Denise Patry. ‘Indo-Himalayan Style Under the Mongols’, in James Watt et al. The World of Khubilai Khan: Chinese Art in the Yuan Dynasty (New York: Metropolitan Museum of Arts, 2010): 103-116. Linrothe, Rob. ‘Peripheral Visions: On Recent Finds of Tangut Buddhist Art’, Monumenta Serica 42 (1995): 235–262. Linrothe, Rob. ‘Ushnishavijaya and the Tangut Cult of the Stūpa at Yulin Cave 3’. National Palace Museum Bulletin 31, no. 4-5 (1996): 1-25. Linrothe, Rob and Jeff Watt. Demonic Divine: Himalayan Art and Beyond. Chicago: Serindia Publication, 2004. Linrothe, Rob ‘The Commissioner's Commissions: Late Thirteenth Century Tibetan and Chinese Buddhist Art In Hangzhou Under the Mongols,’ in Matthew Kapstein et al. Buddhism Between China and Tibet, (Boston: Wisdom Books, 2009): 73-96. Lowry, John. ‘A Fifteenth Century Sketchbook (Preliminary Study)’, in Ariane MacDonald and Yoshiko Imaeda ed., Essais sur l'Art du Tibet (Paris: Librairie D'Amerique et d'Oriente, 1977), 83-118. Mote, Frederik W., Imperial China 800-1900, Harvard: Harvard University Press, 1999. Murata, Jiro. and Akira Fujieda, CHU-YUNG-KUAN: The Buddhist Arch of the Fourteenth century A.D. at the Pass of the Great Wall Northwest of Peking. Kyoto, 1957. Nosh, Juliane. ‘Translation and Transformation in Sino-Tibetan Artefacts of the Yongle Period (1403-1424)’ in Jeong-hee Lee et al. ed. Ritual and Representation in Buddhist Art (Weimar: VDG, 2015): 161-185. Petech, Luciano. ‘Tibetan Relations with Sung China and with the Mongols’, in Morris Rossabi ed. China Among Equals: The Middle Kingdom and its Neighbours, 10th-14th centuries (Berkeley: University of California Press, 1983), 173-203. ‘Phags-pa. The Treatise on The Elucidation of The Knowable. Charles Willemen tr., (BDK English Tripitaka Series 61-VI, 76-I). Berkley, CA: Numata Center for Buddhist Translation and Research, 2004. Roerich, Yury. ‘Mongolo-Tibetskie otnoshenia v XIII and XIV Vekah [Mongolo-Tibetan Relations in the XIII and XIV centuries]’ in Philologia and Istoria Mongolskih Narodov. Pamiaty Academika B.Y. Vladimirtsova [Philology and History of Mongol peoples. In the Memory of Academician B.Y.Vladimirtsov] (Moscow: Izdatelstvo vostochoy literaturi [Eastern Literature Press, 1958): 140-152. Ruysbroeck van, Willem. and Archbishop of Antivari Giovanni di Plano Carpini and William Woodville Rockhill. The Journey of William of Rubruck to The Eastern Parts of The World, 1253-55. London: Bedford press, 1900. Sagaster, Klaus. ‘History of Buddhism Among the Mongols’, in Ann Heirman and Stephan Peter Bumbacher ed. The Spread of Buddhism (Leiden: BRILL, 2007): 379-432. Samosyk, K.F. Buddiiskaia Zhivopis iz Khara-Khoto XII-XIV Vekov. Mezhdu Kitaem i Tibetom [Buddhist Paintings from Khara-Khoto XII-XIV centuries. Between Tibet and China]. St. Petersburg: Izdatelstvo Gosudarstvennogo Ermitazha [The State Hermitage Publishing House], 2006. Schaik van, Sam. and Imre Galambos, Manuscripts and Travellers: The Sino-Tibetan Documents of a Tenth-Century Buddhist Pilgrim. Berlin: de Gruyter, 2012. Schroeder von, Ulrich. 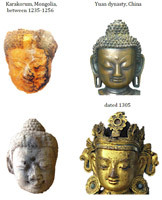 Buddhist Sculptures in Tibet, Hong Kong: Visual Dharma Publications Ltd., 2001. Schuh, Dieter. Erlasse und Sendschreiben Mongolischer Herrscher für Tibetische Geistliche: e. Beitr. zur Kenntnis d. Urkunden d. tibet. Mittelalters u. Ihrer Diplomatik. St. Augustin: VGH-Wissenschaftsverlag, 1997. Shan Zui Gou. Xi Xia Shi Ku [Xi Xia Grotto Temples in Shanzuigou Valley], Ning xia wen wu kao gu yan jiu suo cong kan ning xia wen wu kao gu yan jiu suo cong kan, 2007. Shen Weirong. ‘A Preliminary Investigation into the Tangut Background of the Mongol Adoption of Tibetan Tantric Buddhism,’ in Orna Almogi ed., Contribution to Tibetan Buddhist Literature (Halle (Salle) Germany: Halle International Institute for Tibetan and Buddhist Studies, 2008): 315-350. Shen Weirong. ’Tibetan Buddhism in Mongol-Yuan China (1206-1368),’ in Charles Orzech, Henrik Sorensen, and Richard K. Payne, ed., Esoteric Buddhism and Tantras in East Asia: (Leiden: Brill, 2011): 539-549. Shih-shan Susan Huang. ‘Reassessing Printed Buddhist Frontispieces from Xi Xia’, Zhejiang University Journal of Art and Archaeology 1 (2014): 129-182. Solonin, Kirill. ‘The 'Perfect Teaching' and Liao Sources of Tangut Chan Buddhism: A Study of Jiexing Zhaoxin tu’, Asia Major 26, 1 (2013): 79–125. Sperling, Elliot. ‘Rtsa-mi lo-tsā-ba Sangs-rgyas Grags-pa and the Tangut Background to Early Mongol-Tibetan Relations,’ in Per Kvaerne, ed., Tibetan Studies. Proceedings of the 6th Seminar of the International Association for Tibetan Studies (Oslo: The Institute for Comparative Research in Human Culture, 1994): 801-824. Stoddard, Heather ‘A Stone Sculpture of mGur mGon-po, Mahakala of the Tent, 1292’ Oriental Art xxxi, 3 (Autumn 1985): 278-282. Tucci, Giuseppe. To Lhasa and Beyond. Diary of the Expedition to Tibet in the Year MCMXLVIII. Roma: Ist. Poligr. dello Stato, 1956. Vitali, Roberto. The Early Temples of Central Tibet. London: Serindia Publications, 1990. Watt, James C.Y. et al. When Silk Was Gold. Central Asian and Chinese Textiles. New York: The Metropolitan Museum of Art, 1997. Weldon, David. On Recent Attributions to Aniko, 21 October 2010, http://www.asianart.com/articles/aniko/index.html (Accessed 17.06.2016). Xie Jisheng. 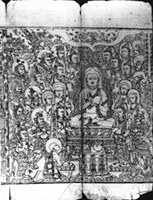 ‘A Unique Tangut Thangka in the Wuwei City Museum: Study of Thangka Discovered in the Tara Cave Temple’, in Xie Jisheng et al. ed. Studies in Sino-Tibetan Buddhist Art: Proceedings of the Second International Conference on Tibetan Archeology and Art, Beijing, September 2-6, 2004 (Beijing: China Tibetology Publishing House, 2006): 427-458. Xie Jisheng at al. Jiang Nan Zang Chuan Fo Jiao Yi Shu [Tibetan Buddhist Art in the South of Yangtse River: Studies on the Buddhist Stone Carvings at Feilai Feng, Hangzhou]. Beijing: Zhongguo Zangxue Chubanshe [China Tibetology Press], 2014. 1. The essay expands on a talk given at the Sixth International Conference on Tibetan Archaeology & Arts in Hangzhou (October, 2015), entitled “Is there anything such as ‘Nepalo-Chinese style’? Reassessment of Buddhist sculptures of Tibetan tradition in Yuan China”. 2. For studies discussing the Xi Xia traits found in Tibetan Buddhism under the Mongols; see Sperling, Elliot. ‘Rtsa-mi Lo-tsā-ba Sangs-rgyas Grags-pa and the Tangut Background to Early Mongol-Tibetan Relations,’ in Per Kvaerne, ed., Tibetan Studies. Proceedings of the 6th Seminar of the International Association for Tibetan Studies (Oslo: The Institute for Comparative Research in Human Culture, 1994): 801-824; Shen Weirong.’A Preliminary Investigation into the Tangut Background of the Mongol Adoption of Tibetan Tantric Buddhism,’ in Orna Almogi ed., Contributions to Tibetan Buddhist Literature (Halle (Salle) Germany: Halle International Institute for Tibetan and Buddhist Studies, 2008): 315-350; Shen Weirong. ’Tibetan Buddhism in Mongol-Yuan China (1206-1368),’ in Charles Orzech, Henrik Sorensen, and Richard K. Payne, ed., Esoteric Buddhism and Tantras in East Asia: (Leiden: Brill, 2011): 539-549. 3. In the course of the present research I use the term ‘Sino-Tibetan art’ to refer to Tibetan Buddhist imagery produced in China and not as indication of style. Tibetan Buddhist imagery will refer to imagery associated with Tibetan Buddhist tradition, no matter who was the maker, not specifically to works necessarily produced by Tibetans or in Tibet. 4. For general information on Xi Xia history see Kychanov, E. I. ‘The Tangut Hsi Hsia Kingdom (982-1227),’ in M.S. Asimov and C. E. Bosworth, ed., History of Civilizations of Central Asia, Vol. IV. The Age of Achievement: A.D. 750 to the End of the Fifteenth Century. Part One. The Historical, Social and Economic Setting, (Paris: UNESCO, 1998): 212-220. 5. For a discussion on Tibetan Buddhism in Hexi after the collapse of the Tibetan Empire see Schaik van, Sam and Imre Galambos, Manuscripts and Travellers: The Sino-Tibetan Documents of a Tenth-Century Buddhist Pilgrim. Berlin: de Gruyter, 2012: 63-67, 73-74; Davidson, Ronald M., Tibetan Renaissance. Tantric Buddhism in the Rebirth of Tibetan Culture. New York: Columbia University Press, 2005: 86. 9. Dunnell, Ruth. ‘Esoteric Buddhism Under The Xixia (1038–1227)’ in Charles Orzech, Henrik Sorensen, and Richard K. Payne, ed., Esoteric Buddhism and Tantras in East Asia (Leiden: Brill, 2011): 465-468. Dunnell, Ruth. ‘The Hsia Origins of theYuan Institutionof Imperial Preceptor’, Asia Major 3rd ser., 5:1 (1992): 85–111. 13. Linrothe, Rob. ‘Peripheral Visions: On Recent Finds of Tangut Buddhist Art’, Monumenta Serica 42 (1995): 235–262. 16. In 1909 the Russian expedition lead by Piotr Kozlov excavated a stūpa in Khara Khoto, a Xi Xia city on the edge of the Gobi desert. Around 300 paintings along with other objects datable to the Xi Xia and Mongol periods were retrieved. They display an unprecedented variety of styles and subjects. These finds are kept in the collection of the State Hermitage Museum, St. Petersburg. For a detailed study see Samosyk, K.F. Buddiiskaia Zhivopis iz Khara-Khoto XII-XIV Vekov. 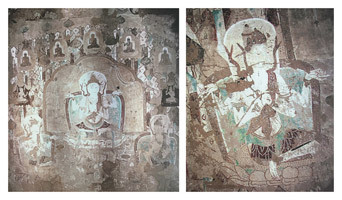 Mezhdu Kitaem i Tibetom [Buddhist Paintings from Khara-Khoto XII-XIV Centuries. Between Tibet and China]. St. Petersburg: Izdatelstvo Gosudarstvennogo Ermitazha [The State Hermitage Publishing House], 2006. 18. Kychanov, E.I. Isstoria Tangutskogo Gosudarstva [History of the Tangut State]. St.Persburg: Fakultet Filologii i Iskusstv St. Peterburgskogo Gosudarstvennogo Universiteta [The Faculty of Philology and Arts of the St. Petersburg State University], 2006: 551. For similar views by professor Xie Jisheng from the Zhejiang University Centre for Buddhist Art, China see http://mypage.zju.edu.cn/en/xiejsh (Accessed 15.06.2016). 19. Dunnell, 2011: 466; Sperling, 1994: 801, 802. 20. Liangzhou was inhabited and ruled by local Tibetans since the time of the Tibetan Empire. According to the Tibetan tradition, during the persecution of Buddhism at the end of the Imperial period some monks escaped to Liangzhou and Tsongkha. The monastic tradition was reintroduced into Central Tibet from these regions in the mid-10th century; see Gray, David. ‘Tibet and the Continent in the Tenth to Thirteenth century’ in Charles Orzech, Henrik Sorensen, and Richard K. Payne, ed., Esoteric Buddhism and Tantras in East Asia (Leiden: Brill, 2011): 451-455. Both Liangzhou and Tsongkha were absorbed into the Xi Xia Empire in the 11th century; see Kychanov, 1998: 213. 21. For details about the Doorda Darqan raid see Sagaster, Klaus. ‘History of Buddhism among the Mongols’, in Ann Heirman and Stephan Peter Bumbacher ed., The Spread of Buddhism (Leiden: BRILL, 2007): 379-432. On hostages at Goden’s court see Artwood, Christopher P. ‘The First Mongol Contacts with theTibetans.’ in Roberto Vitali, Gedun Rabsal, Nicole Willock ed., Trails of the Tibetan Tradition: Papers for Elliot Sperling, Special issue Revue d'Etudes Tibetaines, 31 (Fevrier 2015): 21-45. 22. Roerich, Yury. ‘Mongolo-Tibetskie Otnoshenia v XIII and XIV Vekah [Mongolo-Tibetan Relations in the XIII and XIV Centuries]’ in Philologia and Istoria Mongolskih Narodov. Pamiaty Academika B.Y. Vladimirtsova [Philology and History of Mongol peoples. In the Memory of Academician B.Y.Vladimirtsov] (Moscow: Izdatelstvo vostochoy literaturi [Eastern Literature Press, 1958): 140-152. 23. Dunnell, 1992: 109, 110. 24. Kychanov, E. I., Ocherki Istorii Tangutskogo Gosudarstva [Essays on the History of the Tangut State]. Moscow: Nauka [Scince], 1968: 327. 30. Shen Weirong, 2011: 543. 31. Jing Anning. ‘Financial and Material Aspects of Tibetan Art Under the Yuan Dynasty.’ Artibus Asiae, Vol.64, part 2: 213-240. 33. Jing Anning. ‘The Portraits of Khubilai Khan and Chabi by Anige (1245-1306): A Nepali Artist at the Yuan Court.’ Artibus Asiae, Vol. 54, No. 1/2 (1994): 40-86. 35. Franke, Herbert. ‘Tibetans in Yuan China’, in John D. Langlois Jr. ed., China Under Mongol Rule, (Princeton: Princeton University Press, 1981): 296-328. 36. The estimate of the Xi Xia population as 2,5 million, the majority of whom were settled, is based on Chinese sources of the 11th century. By way of illustration, these sources state that Xi Xia could effectively mobilize an army of more than 500,000 soldiers (see Kychanov, 2008: 8, 80). The estimated population of 1,08 million in Tibet is based on the 13th century Yuan census, which showed that the settled population of Ngari and U-Tsang was 0,234 million people. Thus it was estimated, that the total population (settled and nomads) was 0,64 million for Ngari and U-Tsang, and 0,44 million for Amdo. In comparison, the estimated populations of North China under Jin rule and South China under the Southern Song dynasty were 40 and 70 million people respectively (see Du Zheng. et al. ed. Mountain Geoecology and Sustainable Development of the Tibetan Plateau. Dordrecht; Boston: Kluwer Academic Publishers, 2000: 72; Mote, 1999: 352-353). 37. According to a guide to the Ming dynasty administrative system, in which major routes for travelling officials on assignment were rated by the number of days they took, a trip from Beijing (Dadu during the Yuan) to Ganzhou located in the middle of the Hexi corridor would take 85 days. A trip from Beijing to Chengdu would take 145 days. Trips to Tibet are not rated, but it can be easily extrapolated that a trip from Beijing to Lhasa would take at least 300 days; see Brook, Timothy. The Troubled Empire China in the Ming and Yuan Dynasties. Cambridge; London: The Belknap Press of Harvard University Press, 2010: 31-32, map 3. 38. On the Mahākāla cult in the Yuan as a derivative of an earlier Xi Xia tradition see Sperling, 1994: 806; On the importance of the Uṣṇīṣavijayā cult in Xi Xia see Linrothe, Rob. ‘Ushnishavijaya and the Tangut Cult of the Stūpa at Yulin Cave 3’. National Pālace Museum Bulletin 31, no. 4-5 (1996): 1-25. 39. Shen Weirong, 2011: 546-547. 43. For the Tanguts in the Yuan Buddhist administration see footnote 2 in Solonin, Kirill. ‘The 'Perfect Teaching' and Liao Sources of Tangut Chan Buddhism: A Study of Jiexing Zhaoxin tu’, Asia Major 26, 1 (2013): 79–125; footnote 132 in Shih-shan Susan Huang. ‘Reassessing Printed Buddhist Frontispieces from Xi Xia’, Zhejiang University Journal of Art and Archaeology 1 (2014): 129-182. 44. Dunnell, 2011: 471; Kirill Solonin notes that some Tibetan Buddhist terms translated into Chinese in the early Yuan show a Tangut origin. This would probably suggest that these Chinese translations of Tibetan texts were in fact based on Tangut renditions, or that the Tibetan texts were translated into Chinese by Tangut translators; see Solonin, 2013: 81. 49. Komroff, Manuel. ed. The Travels of Marco Polo. New York: The Modern Library, 1926: 74, 82. 51. Ruysbroeck van, Willem., and Archbishop of Antivari Giovanni di Plano Carpini and William Woodville Rockhill. The Journey of William of Rubruck to The Eastern Parts of The World, 1253-55. London: Bedford press, 1900. 52. Fitzhugh, William et. al and eds. Genghis Khan and the Mongol Empire, New York: W.W Norton & Company, 2013: 137-138. 53. Sagaster, 2007: 381. Huttel, Hans-George. ‘Der Pālast des Ögedei Khan - Die Ausgrabungen des Deutschen Archäologischen Instituts im Palastbezirk von Karakorum [The Pālace of Ögedei Khan - The Excavations of the German Archaeological Institute in the Pālace District of Karakorum]’, in Dschingis Khan und Seine Erben, Das Weltreich der Mongolen [Genghis Khan and His Heirs, the Empire of the Mongols]. (München: Hirmer, 2005): 140–146. 54. Elikhina, J.I. Some Archaeological Findings of the Mongolia-Soviet Expedition Lead by S.V. Kiselev: Karakorum Settlement Relicts Stored in Hermitage Museum. Osaka: National Museum of Ethnology, 2014: 174; Fitzhugh, 2013: 142-143. 56. Karmay, Heather. Early Sino-Tibetan Art. Warminster: Aris and Phillips Ltd, 1975: 21. 58. Mote, Frederik W., Imperial China 800-1900, Harvard: Harvard University Press, 1999: 457-458. 60. Haw, Stephen. Personal communication, 24.11.2015. 61. Dunnell, Ruth. ‘Translating History from Tangut Buddhist Texts’, Asia Major, third series, vol. 22, part 1 (2009): 41-78. 62. Luo, Wenhua. Personal communication, 22.11.2015. 63. Haw, Stephen. ‘Semu Ren in The Yuan Empire’, Ming Qing Yanjiu [XVIII] (2013-2014): 39-63; Personal communication, 24.11.2015. 67. Vitali, Roberto. The Early Temples of Central Tibet. London: Serindia Publications, 1990: 105. 69. Lee, Sherman and Wai-kam Ho, Chinese Art under the Mongols: The Yuan Dynasty (1279-1368). Cleveland: Cleveland Museum of Art, 1968: 3-5. 71. Lee, 1968: catalogue entry 16. 73. Lee, 1968: catalogue entry 24. 74. Lee, 1968: catalogue entry 276-281. 75. Karmay, 1975: 21, footnote 99. 76. Karmay, 1975: footnote 99. 77. Jing, 1994: footnote 2; page 66. 78. Jing, 1994: 48, 56, 65. 81. Linrothe, 1995: 261, 262. 82. Leidy, Denise Patry. ‘Indo-Himalayan Style under the Mongols’, in James Watt et al.,The World of Khubilai Khan: Chinese Art in the Yuan Dynasty (New York: Metropolitan Museum of Arts, 2010): 103, 110. 85. Weldon, David. On Recent Attributions to Aniko, 21 October 2010, http://www.asianart.com/articles/aniko/index.html (Accessed 17.06.2016). 86. Adams, Phillip. ‘Imperial Yuan Gilt-Metal Buddhist Sculptures: Stepping Stones to the Early Ming’, Orientations; Volume 45, number 8 (Nov/Dec 2014): 92-100; Bigler, Robert. Art and Faith at the Crossroads: Tibeto-Chinese Buddhist Images and Ritual Implements from the 12th to the 15th Century (with an essay by Béla Kelényi). Zurich: Garuda Verlag, 2013:8; Bigler, Robert. Before Yongle: Chinese and Tibeto-Chinese Buddhist Sculpture of the 13th and 14th Centuries (with an essay by Béla Kelényi). Zurich: Garuda Verlag, 2015: 8, 12. 88. Bigler, 2013: 38; Bigler, 2015:74-96. 89a. On depictions of Indian pandits and Tibetan monks in Tibetan art see Jackson, David Mirror of the Buddha: Early Portraits from Tibet. New York: Rubin Museum of Art, 2011:35-65. In addition, Sakya red hats are normally significantly less pointed than the hat depicted in the painting discussed by Casey. Therefore, the figure in the painting is most likely depicting an Indian pandit as a member of the Medicine Buddha entourage. As an example of the Medicine Buddha entourage with figures of Indian pandits, see an early 15th century painting in Jackson, 2011: fig.2.35. 90. To my knowledge, neither depictions of Qubilai khan as King Songtsen Gampo nor as Bodhisattva Mañjuśrī are known. In addition, Qubilai khan was always portrayed with facial hair unlike the figure in the miniature painting. On the other hand, a depiction of Songtsen Gampo in similar Mongol style clothing can be found in the upper right of a painting from a private collection published in Kossak, Steven M. and Jane Casey Singer. Sacred Visions Early Paintings from Central Tibet, 1998:78-79. Thus the discussed figure most likely represents King Songtsen Gampo as a part of the Medicine Buddha entourage. On depictions of the ancient Tibetan kings associated with the Medicine Buddha tradition see Jackson, 2011: 65, fig.2.35. The Mongols often donated luxurious textiles and clothing along with other valuable objects to Tibetan monks as a reward for teachings and initiations. Consequently, opulent aesthetics of the Yuan China became prestigious in Tibet and manifested in Tibetan art. The discussed depictions of the Tibetan king in Mongol style garb are prime examples of this trend. For material donations to Tibetan monks during the Yuan and the impact of the Yuan aesthetics on Tibetan art, see Jing, 2004: 215. For a discussion on luxurious silk textiles during the Mongol rule and the practice of donating them to Tibetans, see Watt, 1997:127-141. For a particular example when Guyug khan bestowed two hundred precious robes among other gifts on Tibetan monasteries in 1247, see Petech, Luciano. ‘Tibetan Relations with Sung China and with the Mongols’, in Morris Rossabi ed. China Among Equals: The Middle Kingdom and its Neighbours, 10th-14th centuries (Berkeley: University of California Press, 1983), 173-203. 91. 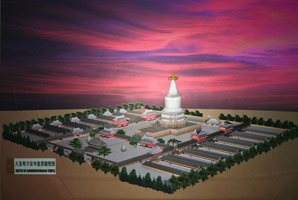 One of the paintings was represented in a commemorative book issued by the Jokhang Temple in commemoration of the completion of the Jokhang Temple golden roof restoration in 2015. The dating of the Jokhang paintings was provided by Luo Wenhua. Another example is the 13th to 15th century sculptures of Densatil Monastery, which are believed to be mostly the work by Nepalese artists. However, they well reflect Tibetan taste and are stylistically very different from contemporaneous works produced in the Kathmandu Valley (on Nepalese artists employed at Densatil see Tucci, Giuseppe. To Lhasa and beyond. Diary of the Expedition to Tibet in the Year MCMXLVIII. Roma: Ist. Poligr. dello Stato, 1956:127f. ); A 16th century example is a figure of Bodhisattva Avalokiteśvara made by Newar artist Apha Jyoti, the Asia Society Museum, New York. 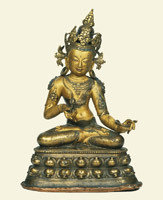 The style of the figure is totally different from the Nepalese style, see http://www.asiasocietymuseum.org/treasure_object.asp?ObjectID=499 (Accessed 17.06.2016). The most relevant example, however, is a sketch book by Nepalese artist Jivarama, who likely worked in Central Tibet. The book is written in Newari language and dated to the equivalent 1435. It is designed in the form of a long folded strip with illustrations on its sides. Twenty out of forty six illustrated sides depict Chinese style imagery and decorative motives that constitutes nearly a half of the book.The illustrations not only demonstrate popularity of the Chinese aesthetics in the early 15th century Tibet, but also confirm that the Chinese style was mastered by Nepalese artists and became an integral part of their artistic vocabulary by that time. For a detailed study of the book, see Lowry, John. 'A Fifteenth Century Sketchbook (Preliminary Study)’, in Ariane MacDonald and Yoshiko Imaeda ed., Essais sur l'Art du Tibet (Paris: Librairie D'Amerique et d'Oriente, 1977), 83-118. 95. Jakson, David. The Nepalese Legacy in Tibetan Painting. New York: Rubin Museum of Art, 2010: 67-99. 96. Stoddard, Heather ‘A Stone Sculpture of mGur mGon-po, Mahākāla of the Tent, 1292’ Oriental Art xxxi, 3 (Autumn 1985): 278-282; Heller, Amy. Tibetan Art, Tracing the Development of Spiritual Ideals and Art in Tibet, 600-2000 A.D., Milano: Jaca Book, Antique Collector’s Club, 1999: 99; Leidy, 2010:108; Casey, 2014. 97. Kujip van der, Leonard. “Bays and Baysi-s in Tibetan Historical, Biographical and Lexicological Texts”, in Central Asiatic Journal 39/2 (1995a):275-301. 98. The sculpture is dated according to the Tibetan calendar to the year of male water dragon, a date probably corresponding to the year 1292; see Stoddard, 1995. If the sculpture had been made in China, it would unlikely have been dated according to the Tibetan calendar. For instance, even decrees issued for Tibet by the Bureau of Buddhist and Tibetan affairs in Dadu used the Chinese and not Tibetan calendars; see Schuh, Dieter. Erlasse und Sendschreiben mongolischer Herrscher für tibetische Geistliche: e. Beitr. zur Kenntnis d. Urkunden d. tibet. Mittelalters u. ihrer Diplomatik. St. Augustin: VGH-Wissenschaftsverlag, 1997:170. Another example is the already mentioned Palace Museum Mañjuśrī, which is dated to the fifteenth day of the fifth month of the ninth year of Dade’s reign (1297 – 1307), a date corresponding to the year 1305; see Adams, 2014: 92-93. 99a. For a discussion on this issue see Schroeder von, 2010: 371-376, fig. 120B-C, 121A, 121B, 121D, 121E, 122B, 122C, 122D, 126A-B, 126 C-D.
100. Jing, 1994: 49, 55. 101. 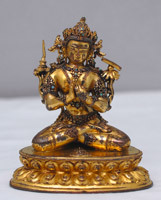 Many metal replicas, traditionally attributed to the 13th-14th centuries, can still be seen in Tibetan monastic collections; see Schroeder von, Ulrich. 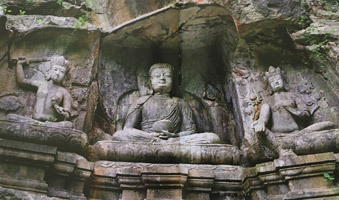 Buddhist Sculptures in Tibet, Hong Kong: Visual Dharma Publications Ltd., 2001:365. 102. Campbell, Aurelia. “The Introduction of Tibetan Buddhist Architectural Forms Under the Mongol Rule in China” a presentation given at the Sixth International Conference on Tibetan Archaeology and Arts, Hangzhou (October, 2015). 103. Gutschow, Niels. The Nepalese Caitya: 1500 Years of Buddhist Votive Architecture in the Kathmandu Valley. Stuttgart: Menges, 1997: 188. 104. 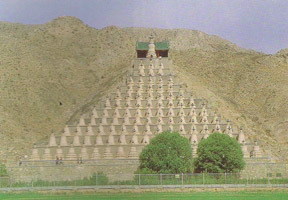 Indian Pāla style stūpa-like superstructures can also be observed on the top of the Xi Xia Kangjisi pagoda and Baisikou twin pagodas; see Lei Runze, ‘The structural Character and Tradition of Ningxia’s Tangut stūpas’, Orientations, (April 1996): 55-62. 107. Chang Qing. ‘The Portrait of Yang Rinchen Skyabs at Feilaifeng of Hangzhou and Its Reception in the Yuan and Ming Periods’ in Xie Jisheng at al., Jiang Nan Zang Chuan Fo Jiao Yi Shu[Tibetan Buddhist Art in the South of Yangtse River: Studies on the Buddhist Stone Carvings at Feilai Feng, Hangzhou] (Beijing: Zhong Guo Zang Xue Chu Ban She [China Tibetology Press], 2014): 423-460. 108. Xie Jisheng at al. Jiang Nan Zang Chuan Fo Jiao Yi Shu[Tibetan Buddhist Art in the South of Yangtse River: Studies on the Buddhist Stone Carvings at Feilai Feng, Hangzhou]. Beijing: Zhong Guo Zang Xue Chu Ban She [China Tibetology Press], 2014. 109. Linrothe, Rob ‘The Commissioner's Commissions: Late Thirteenth Century Tibetan and Chinese Buddhist Art In Hangzhou Under the Mongols,’ in Matthew Kapstein et al., Buddhism Between China and Tibet, (Boston: Wisdom Books, 2009): 73-96, 85. 110. Chang Qing, 2014: 438. 112. Lai Tianbing. Han Zang Gui Bao [Treasures of Sino-Tibetan art: A Study on the Sculptures at Feilaifeng in Hangzhou]. Beijing: Wen Wu Chu Ban She [Cultural Relics Publishing House], 2015. 114. Other prominent Tanguts included Guan Zhuba and Shaluoba. See footnote 38. 115. On the importance of Uṣṇīṣavijayā cult in Xi Xia see Linrothe, 1996. 116. Lai Tianbing, 2015: 327. 117. On the attribution of cave 465 to the Xi Xia period see Xie Jisheng. The Murals of Mogao Cave 465: New Evidence for 12th Century Tangut Xia Patronage: Orientations 35 (5) (2004): 38-45. 118. See for instance an early 14th century Ratnasambhava panting from the Rubin Museum of Art, New York, published in Brauen, Martin. Mandala: Sacred Circle of Tibetan Buddhism. New York: Rubin Museum of Art, 2009: 95. 119. Xie Jisheng proposed late 12th early 13th century date for the painting in his presentation “Some Remarks upon Images of Thousand-Buddhas Seen in Cave Bo-gDong-po, sPang-pa and on the Thangkas Discovered in West Tibet and Silk Road” given at the Sixth International Conference on Tibetan Archaeology and Arts, Hangzhou (October, 2015). 120. Xie Jisheng, 2014:267, 315, 340, 346. 121. 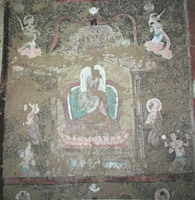 Saḍakṣarī Avalokiteśvara and Uṣṇīṣavijayā are depicted as Chinese deities in the Xi Xia caves of the Shanauigou valley, see Shan Zui Gou. Xi Xia Shi Ku Shang Xia Jing [Xi Xia Grotto Temples in Shanauigou Valley], Ning xia wen wu kao gu yan jiu suo cong kan ning xia wen wu kao gu yan jiu suo cong kan, 2007:349; for the Tibetan mode depictions see Samosyuk, 2006: 266, 276. 122. The Hexi canon was probably a publication of the Xi Xia canon, originally compiled in the Tangut language in Xi Xia by the end of the twelfth century. The Puning canon was carved at the Puning monastery in Hangzhou. Production was started in 1274 and completed in 1290. Work on the Qisha canon began during the Song dynasty at the Qisha Yangsheng monastery and continued at Hangzhou during the Yuan, where it came to incorporate the Puning canon. Tibetan esoteric material was added to both the Puning and Qisha canons in the early 14th century; see Shih-shan Susan Huang. ‘Reassessing Printed Buddhist Frontispieces from Xi Xia’, Zhejiang University Journal of Art and Archaeology 1 (2014): 129-182; and Chia, Lucille. ‘The Life and Afterlife of Qisha cannon (Qishazang)’, in Jang Wu and Lucille Chia, Spreading Buddha's Word in East Asia: The Formation and Transformation of the Chinese Buddhist Canon (New York: Columbia University Press, 2016): 201-238. 123. Shih-shan Susan Huang, 2014:160. 124. On Shaluoba and Guan Zhuba; see Translator’s introduction in ‘Phags-pa. The Treatise on The Elucidation of The Knowable. Charles Willemen tr., (BDK English Tripitaka Series 61-VI, 76-I). Berkley, CA: Numata Center for Buddhist Translation and Research, 2004:6; and Franke, Herbert. ‘Sha-Lo-Pa (1259-1314), A Tangut Buddhist Monk in Yuan China’ in von Gert Naundorf et al. eds., Religion und Philosophie in Ostasien: Festschrift für Hans Steininger zum 65. (Würzburg: Königshausen & Neumann, 1985): 201-222. 125. Chia, 2016: 209, 210. 126. Chia, 2016: 208, 209. 128. These frontispieces have been traditionally dated on the basis of dates found in the colophons of these sutras, Lucille Chia, however, shows that the dates of these texts do not necessarily correspond to the dates of the frontispieces. She proposes a rather loose dating for the whole group, sometime in the first decade of the 14th century; see Chia, 2016: 235, 236, footnote 58. 129. Dunnell, 2011: 471; Shih-shan Susan Huang: 161. 130. For the same kind of the template used in the Puning canon see Shih-shan Susan Huang, 2014: fig.40. 131. Shih-shan Susan Huang, 2014: 161, footnote 143; Chia, 2016: 214, 215. 133. See examples in Shih-shan Susan Huang, 2014: 161, 162. 135. For the distinction between depictions of lintel ends in Nepalese and Indian Pāla style paintings see Jackson, 2010: 91. 136.Shih-shan Susan Huang, 2014: 161. 137. Shih-shan Susan Huang, 2014: 162. 139. 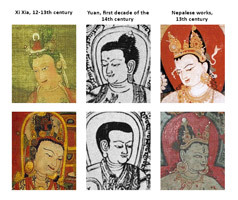 Describing the painting of Bodhisattva Samantabhadra (top image on the left in figure 22), Kira Samosyuk suggested that the Bodhisattva’s face represents the physiognomy of Tangut people; see Samosyuk, 2016: 160. 142. See for instance, Jing, 1994:68; Leidy, 2010: 110; McCausland, Shane. The Mongol Century: Visual Cultures of Yuan China, 1271 – 1368. London: Reaktion Books, 2016:113. 143. Luo Wenhua. Private conversation, October 2015, Hangzhou. 144. See Adams, 2014; Bigler, 2013; Bigler, 2015. 145. For example, scrollwork almost identical to that in the Yuan sculptures can be seen in a 13th-14th century golden cup excavated from a Mongolian tomb, Inner Mongolia Museum, Huhehaote, published in Carter, Marc. et al. Empires Beyond the Great Wall: The Heritage of Genghis Khan. Los-Angeles: Natural History Museum of Los Angeles County, 1993: 187, figure 103. 146. This dating was confirmed by TL and radiocarbon tests, see Fitzhugh, 2013: 143, 148. 147. For Xi Xia metal sculptures in the Chinese tradition see Zhu Qixin. ‘Bronze Buddhist Figures of the Late Western Xia Dynasty,’ Orientations 22, no. 10 (1991): 62-64; In his letter written to Sergey Oldenburg dated 9-10 July 1909, Piotr Kozlov mentioned approximately ten ‘especially interesting’ metal sculptures found in the famous stūpa in Khara-Khoto. The fate of these sculptures is unknown as they are not currently present in the Hermitage collection of the Khara-Khoto material. See Bukharin, M.D. ‘Pisma P.K. Kozlova S.F. Oldendurgu iz Sobrania PFA RAN.’ Problemy Isorii, Filologii, Kultury 4(38) (2012), 288-304. 148. Xie Jisheng provides a discussion of the painting and the features of late 12th - early 13th century Xi Xia imagery; see Xie Jisheng. 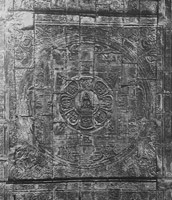 ‘A Unique Tangut Thangka in the Wuwei City Museum: Study of Thangka Discovered in the Tara Cave Temple’, in Xi Jishend et al. ed., Studies in Sino-Tibetan Buddhist Art: Proceedings of the Second International Conference on Tibetan Archeology and Art, Beijing, September 2-6, 2004 (Beijing: China Tibetology Publishing House, 2006): 427-458. 149. For a discussion on Sun-Moon Avalokiteśvara see Chandra, Lokesh. and Nirmala Sharma. Buddhist Paintings of Tun-Huang In the National Museum, New Delhi. New Delhi: Niyogi Books, 2012: 161-163. 150. Watt, James C.Y. et al. When Silk Was Gold.Central Asian and Chinese Textiles. New York, The Metropolitan Museum of Art, 1997: 98. 153. See Samosyuk, 2006: fig. 2, 100, 116, 133, 158, 168. 154. For a discussion of this particular design and other features of the Indian Pāla style in Tibetan art; see Jackson, 2010: 94-95. 155. 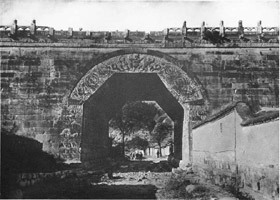 Murata, Jiro and Akira Fujieda, CHU-YUNG-KUAN: The Buddhist Arch of the Fourteenth century A.D. at the Pass of the Great Wall Northwest of Peking. Kyoto, 1957. 161. See for instance Schroeder von, 2001:1246. 162. Henss, Michael. TIBET – Monasteries Open Their Treasure Rooms – The exhibition and Its Book: A Review. 25 December 2007 http://asianart.com/articles/henss/index.html (Accessed 21.06.2016), fig. 19 a-d, fig. 20. 163. See Sotheby's Hong Kong auction sale catalogue, 7 October 2007, lot 803. 164. See China Guardian auction sale catalogue, 28.04.2013, lot 3798 (http://english.cguardian.com/categories/pwf/2013-04-28/38520.html). 165. See http://www.britishmuseum.org/research/collection_online/collection_object_details.aspx?assetId=15841001&objectId=261567∂Id=1 There is yet a disagreement among scholars as to whether the throne and the backrest should be attributed to the Yongle reign or a later period; see David Weldon forthcoming article. 166. See Schroeder von, 2001: Vairochana in fig. 345 C-D is depicted with a gesture typical of Chinese examples (see a Song dynasty Buddha Vairochana figure in the National Palace Museum, Taipei, museum number 1939.4); Another example of Chinese iconography is a Bodhisattva figure in Virginia Museum of Fine Arts collection, museum number 73.77.1, see http://vmfa.museum/collections/art/wenshu-bodhisattva-manjusri (Accessed 09.08.2016). A few more Yongle figures likely represent Chinese iconography, see Schroeder von, 2001: 352 E, 355 A. 167. In general, figures in Central Tibetan examples display more energetic postures and gestures; figures of Mahākāla have significantly wider shoulders. See Linrothe, Rob and Jeff Watt. Demonic Divine: Himalayan Art and Beyond. 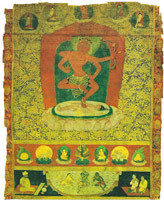 Chicago: Serindia Publication, 2004: fig 2.2 for a 12th century Central Tibetan image of Mahakala Panjarnata; fig. 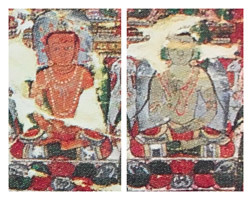 2.4, 2.6 for 13th century Central Tibetan images of Caturbhuja Mahākāla; fig.2.7 for a 13th -14th century Central Tibetan image of Ṡri Devī. 168. Nosh, Juliane. ‘Translation and Transformation in Sino-Tibetan Artefacts of the Yongle Period (1403-1424)’ in Jeong-hee Lee et al. ed., Ritual and Representation in Buddhist Art (Weimar: VDG, 2015): 161-185.